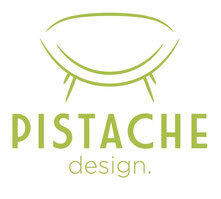 Lights - Pistache Design, High End Vintage Design! 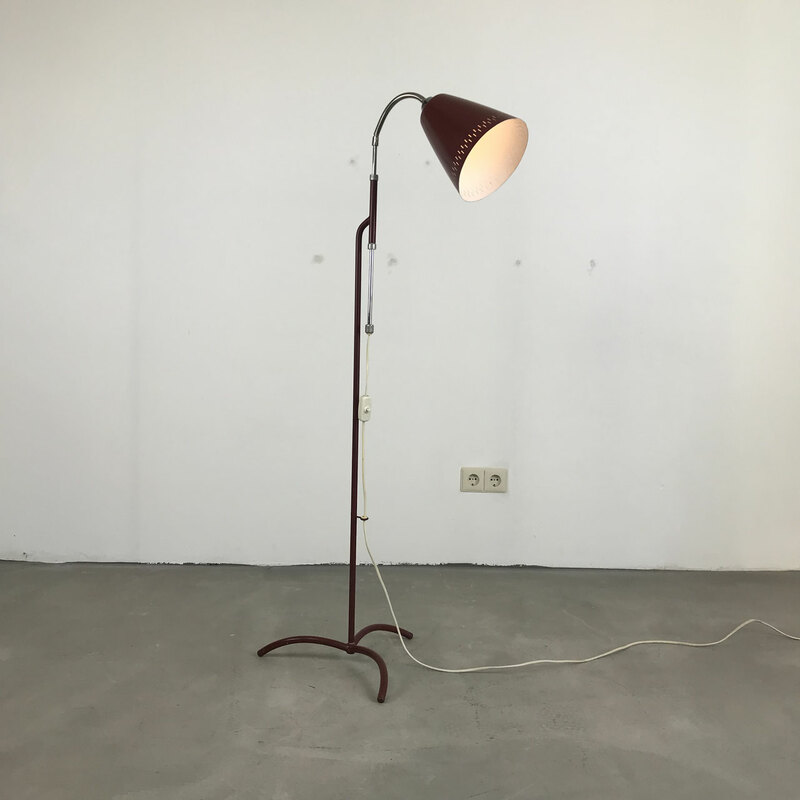 Op deze pagina vind je verlichting die ooit een andere eigenaar hebben gehad, pre-owned en pre-loved. 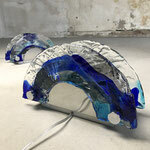 Prachtige design klassiekers, collectors items en populaire design meubelen en verlichting. 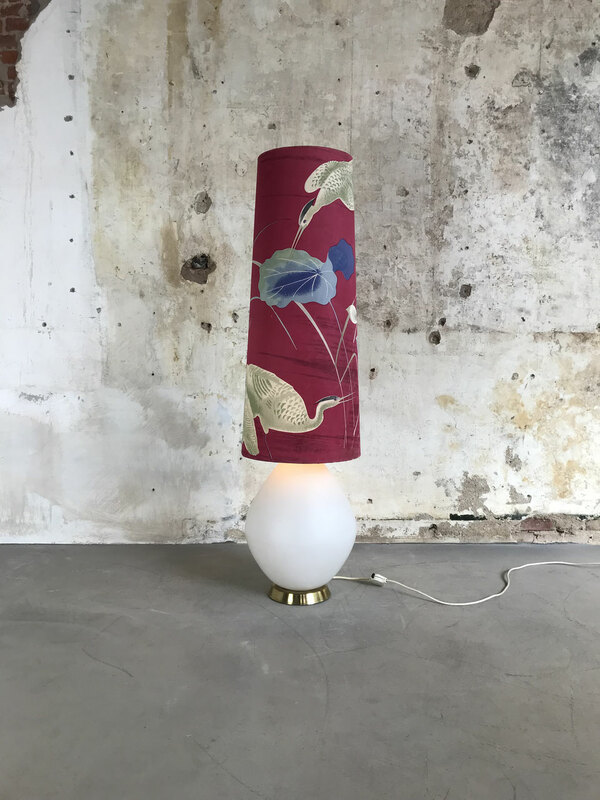 Je kunt ze online in je bezit krijgen of je kan een bezoek brengen aan onze leuke winkel en onder het genot van een kopje koffie jouw favoriete design-stuk uitproberen. zodat je zelf het product kan beoordelen en uitproberen aangezien pre-owned producten niet geretourneerd kunnen worden. 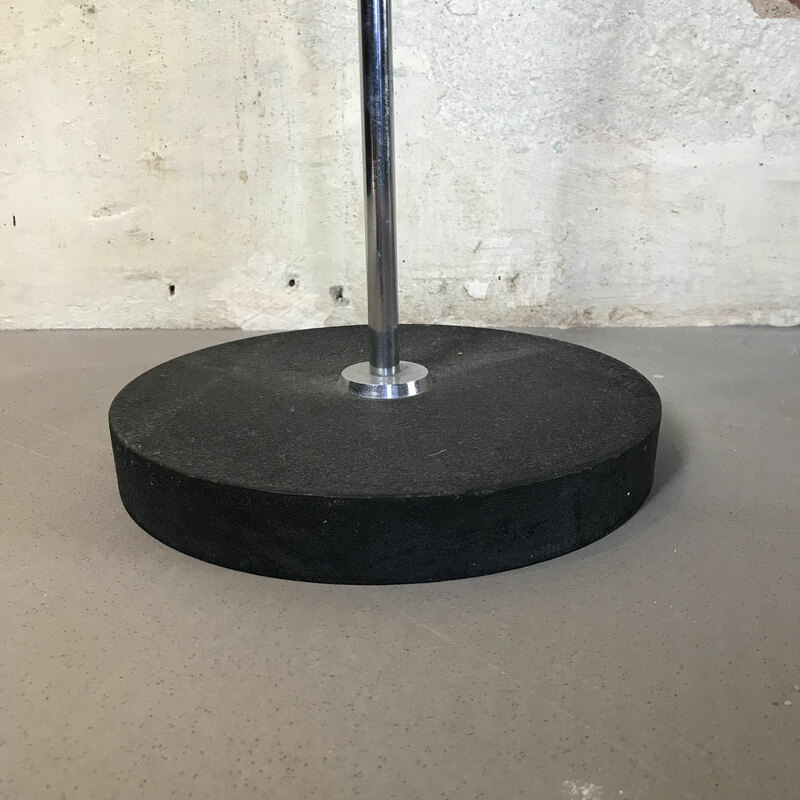 Wil je hetgeen je gekocht hebt toch laten bezorgen dan is dit mogelijk tegen een redelijke vergoeding. On this page you will find lightning that have had a previous owner. Beautiful design classics, collectors items and popular design furniture and lightning. You can get them online in your possession ( if you are interested in an item, please send us an email) or you can visit our nice store. Adorable vintage table lamp in the style of Jacques Biny, France 1950s. 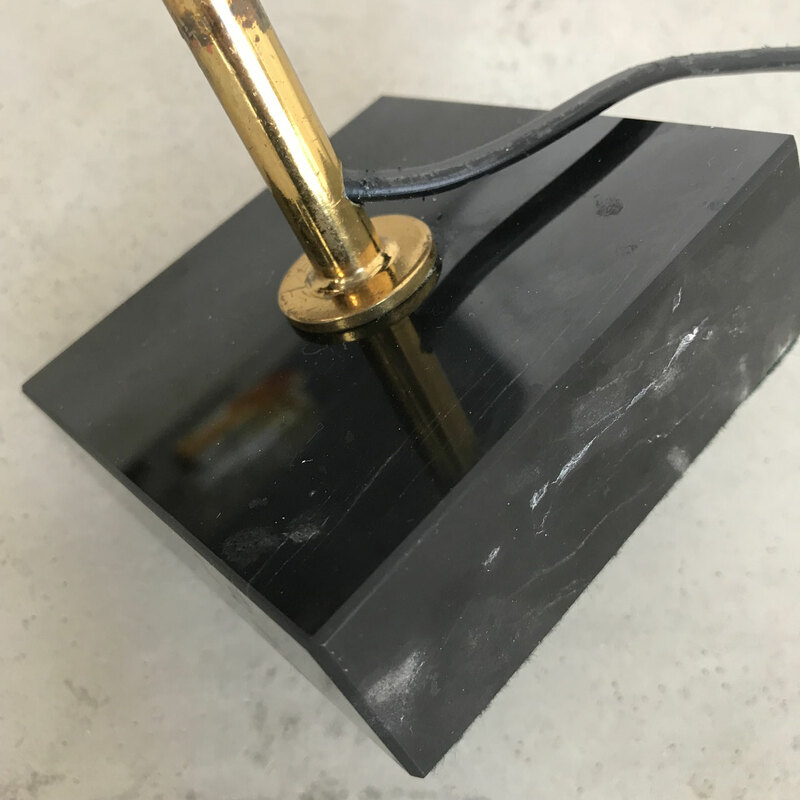 Black lacquered hood, brass rod and Black marble base. In good vintage condition and technically 100%. 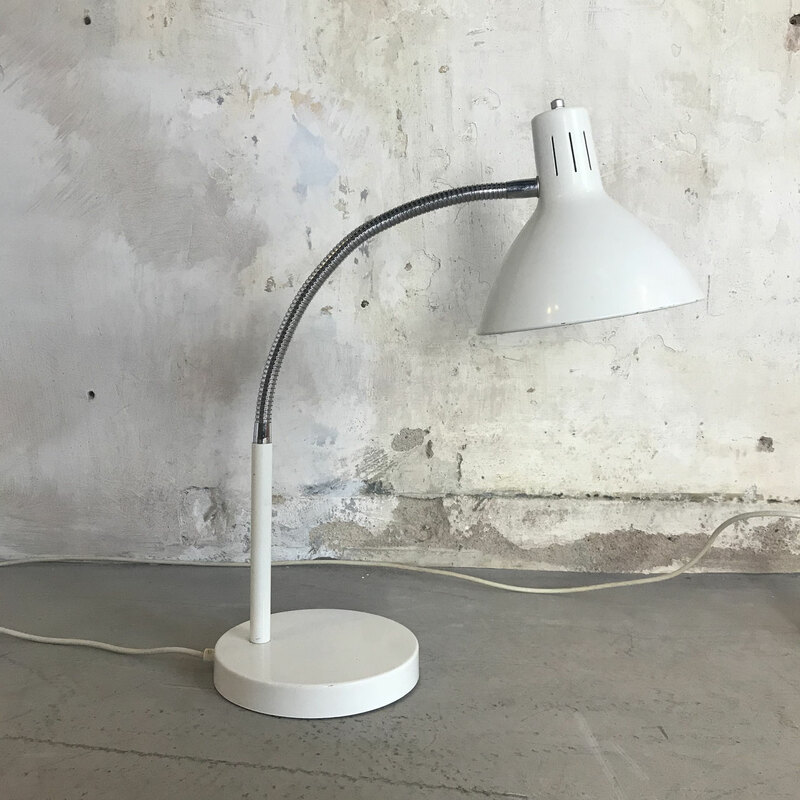 Conical table lamp by Peill and Putzler from the 1980's. In a very good condition. 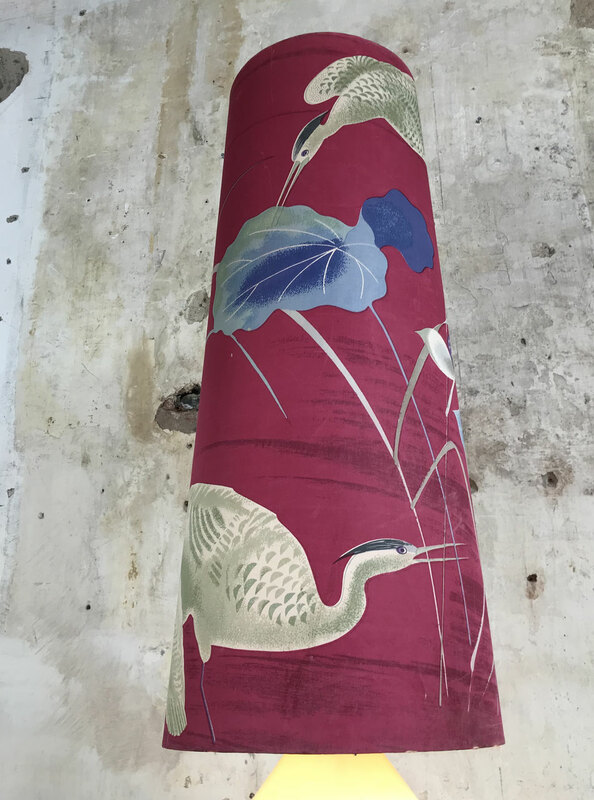 Beautiful opaque glass (frosted glass) in great condition. 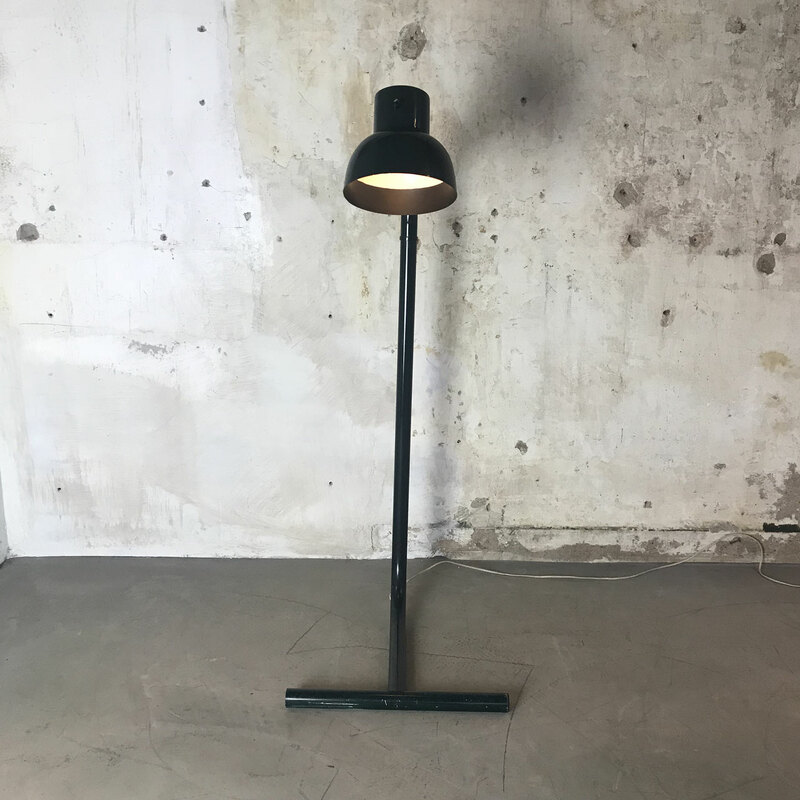 This floor lamp from the 1950s is made of lacquered steel with a red lampshade made from lacquered metal which can be arranged in different directions. 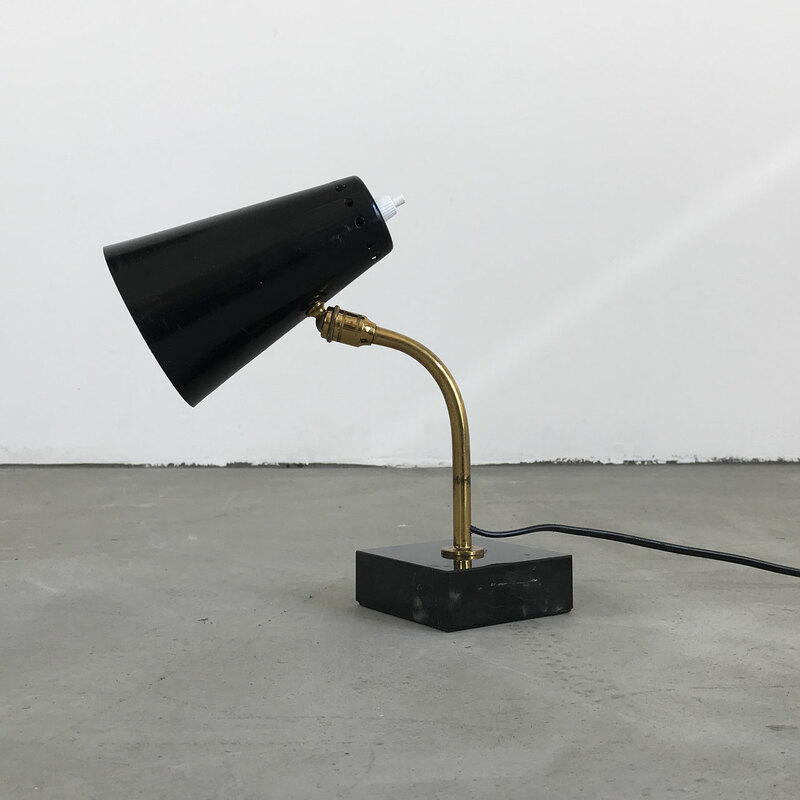 The piece is in an original vintage condition and fully functional. 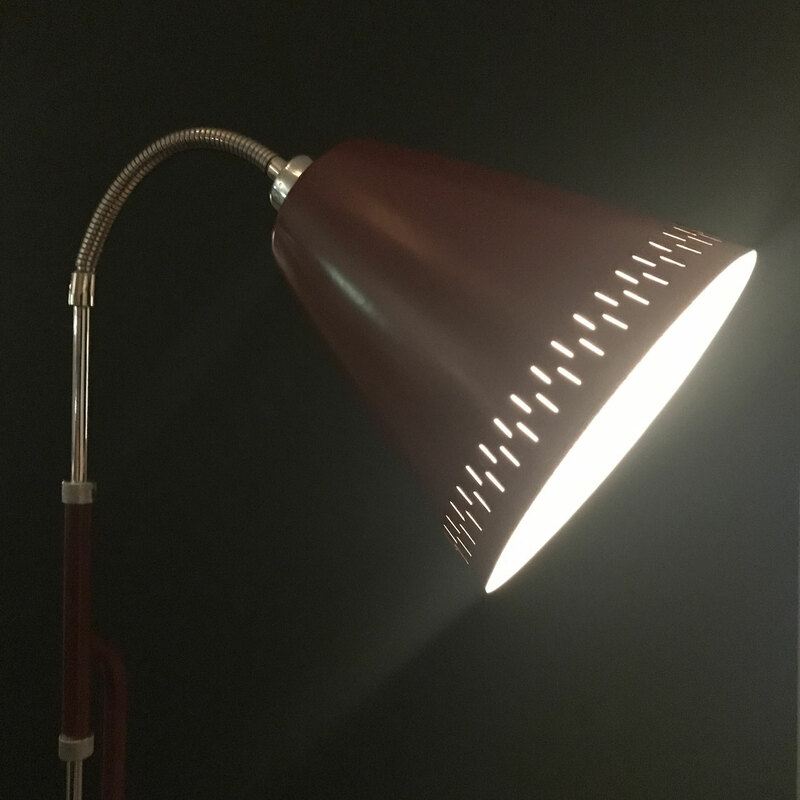 This vintage item is not damaged, but may show minor signs of age-related wear, age-related patina. 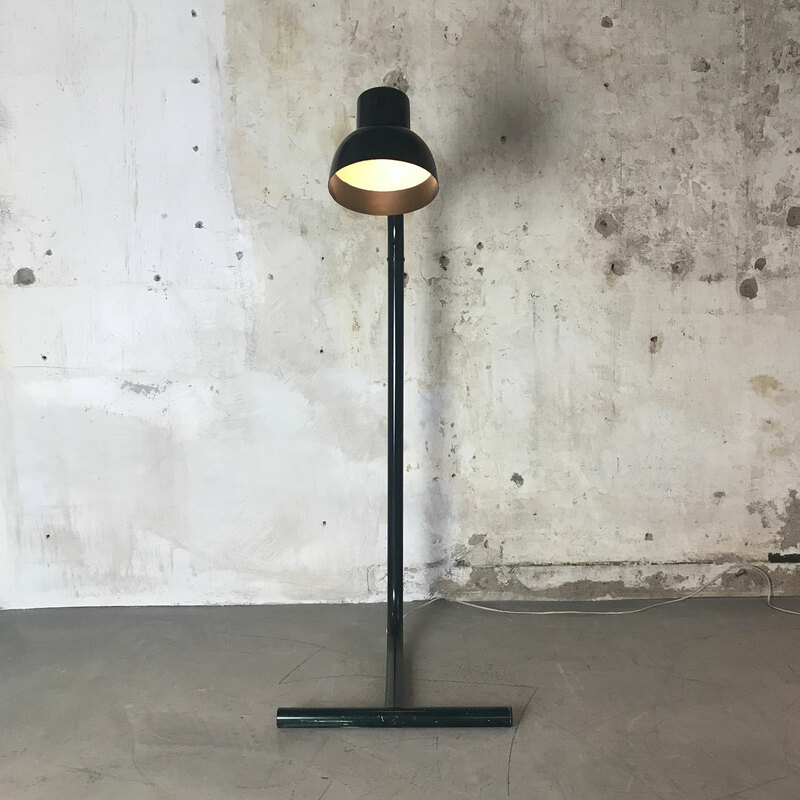 Very elegant double headed brass standing floor lamp. 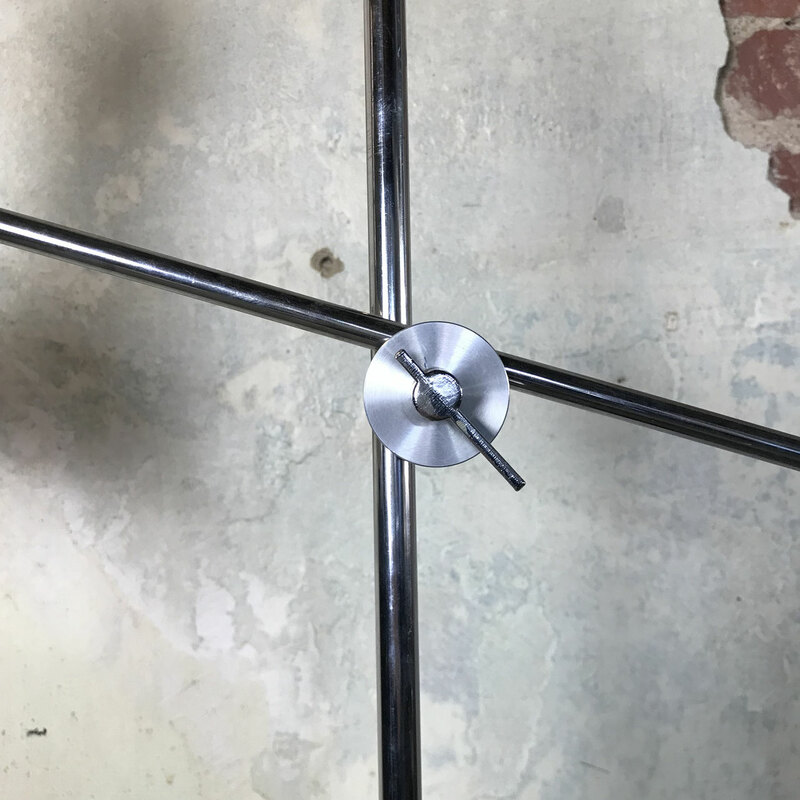 Each spot can be arranged in different directions. 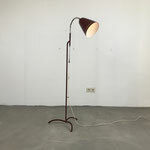 This floor lamp is in good original condition with desirable patina. 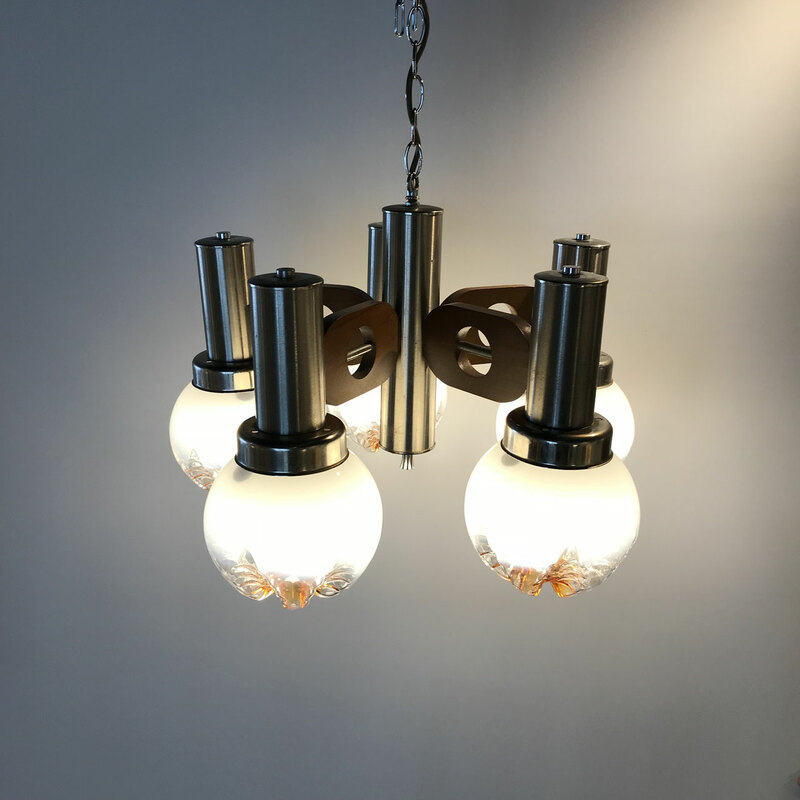 Stilnovo Style' Spider chandelier from the 60s. 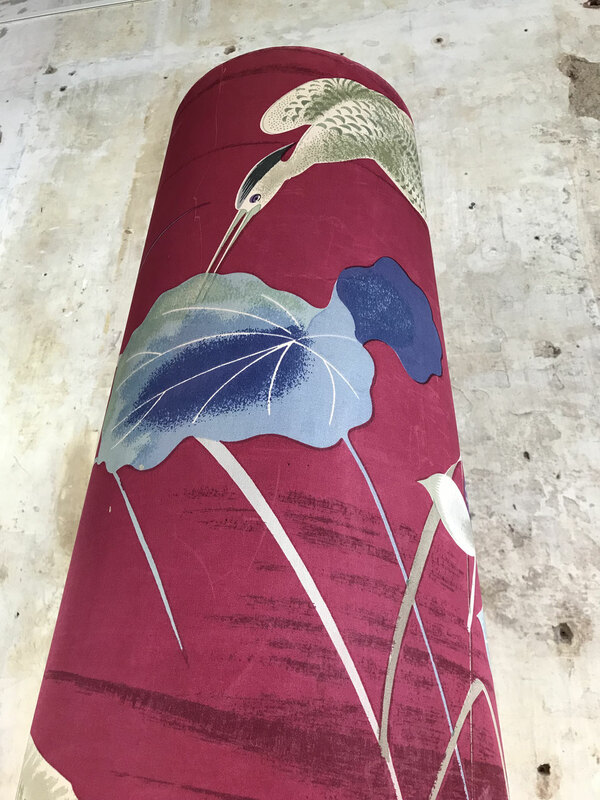 Great design, nice and large and completely in original condition. 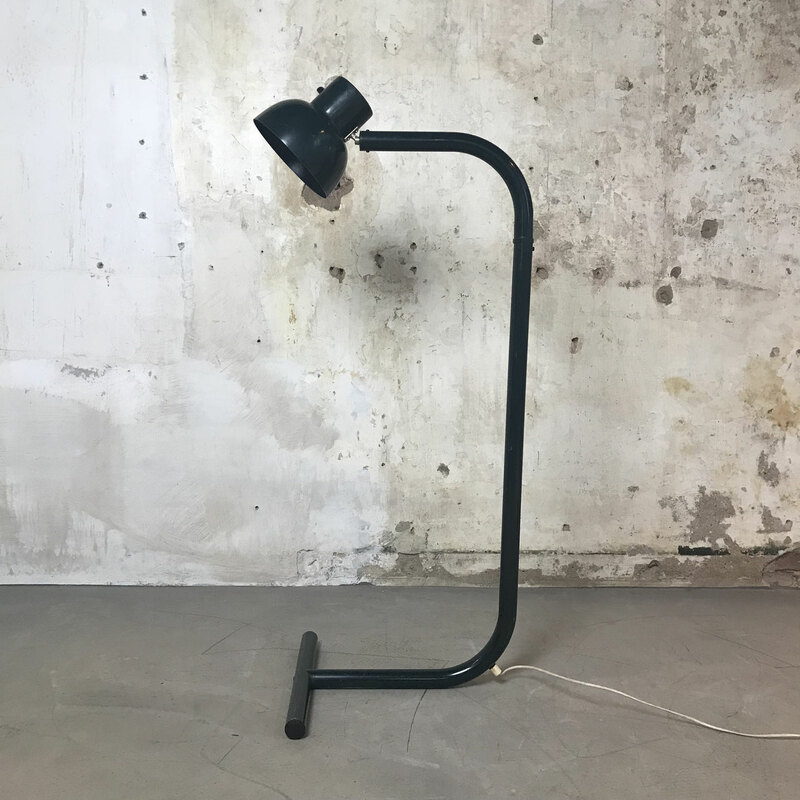 This spin lamp, whose arms can be bent in any desired position, has a black metal hood at the end of its 5 arms. 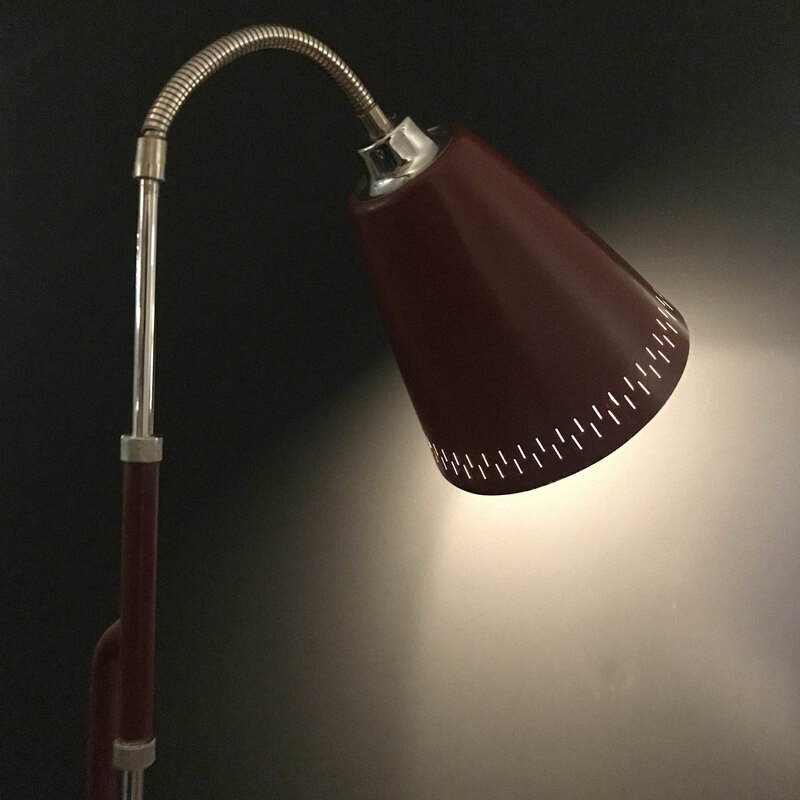 The lamp is, despite its age, in a good condition, although there are of course slight traces of use visible. 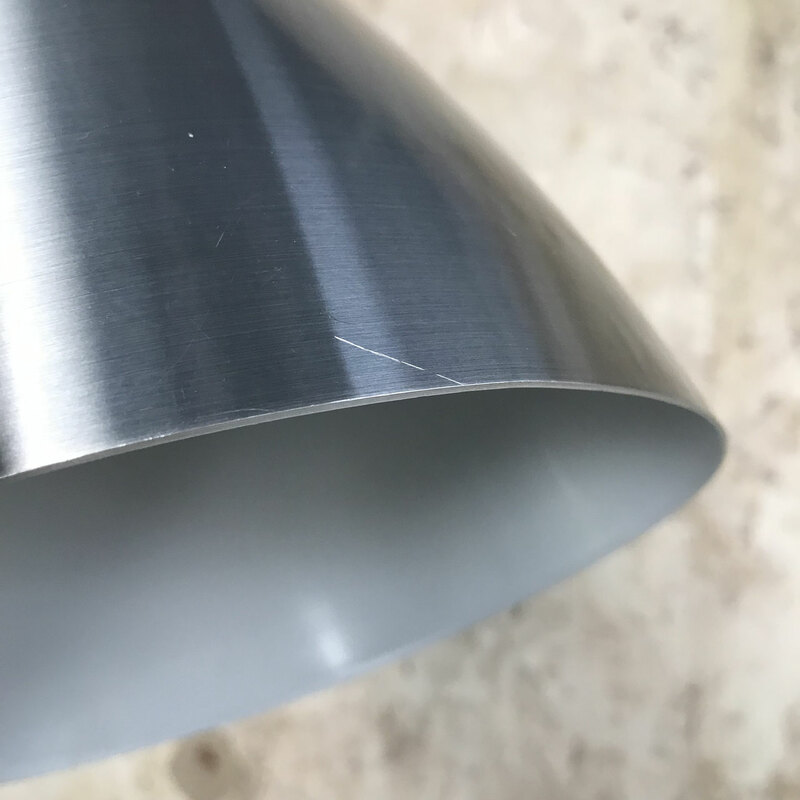 The lamp has deliberately not been polished! 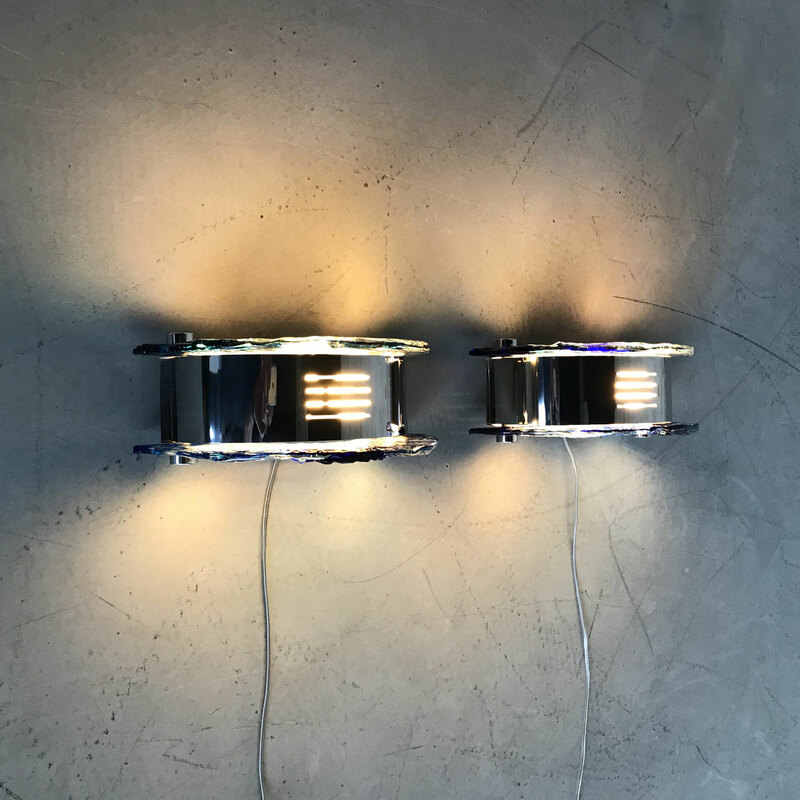 New LED light sources (E14 fitting) are included. 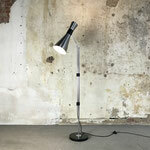 The lamp is height adjustable (from 70 to max 110 cm) and has a diameter of maximum 80 centimeters. 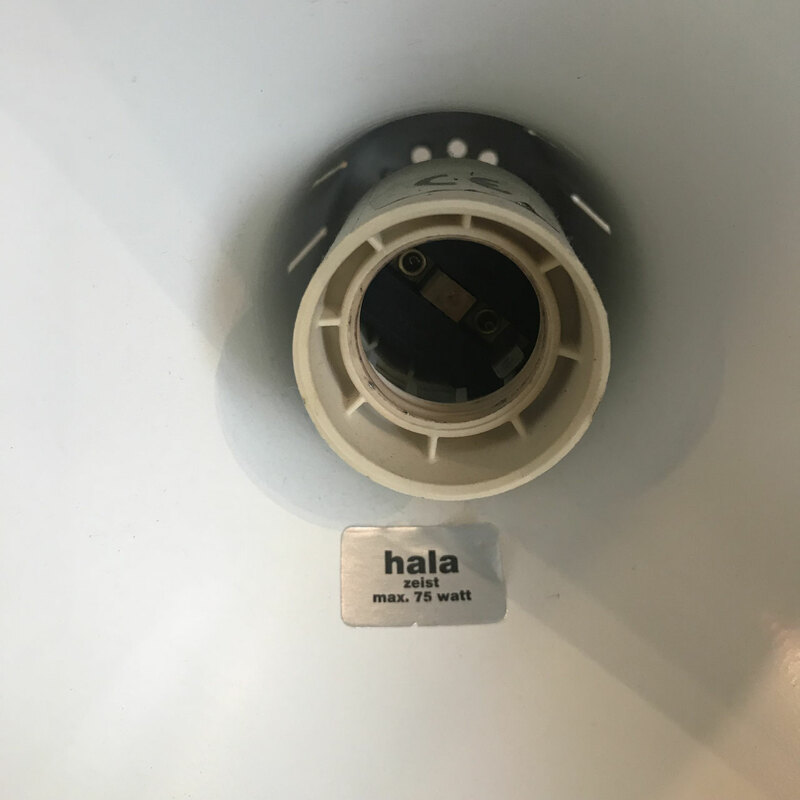 The hoods are 15 cm long with a diameter of 8 cm. 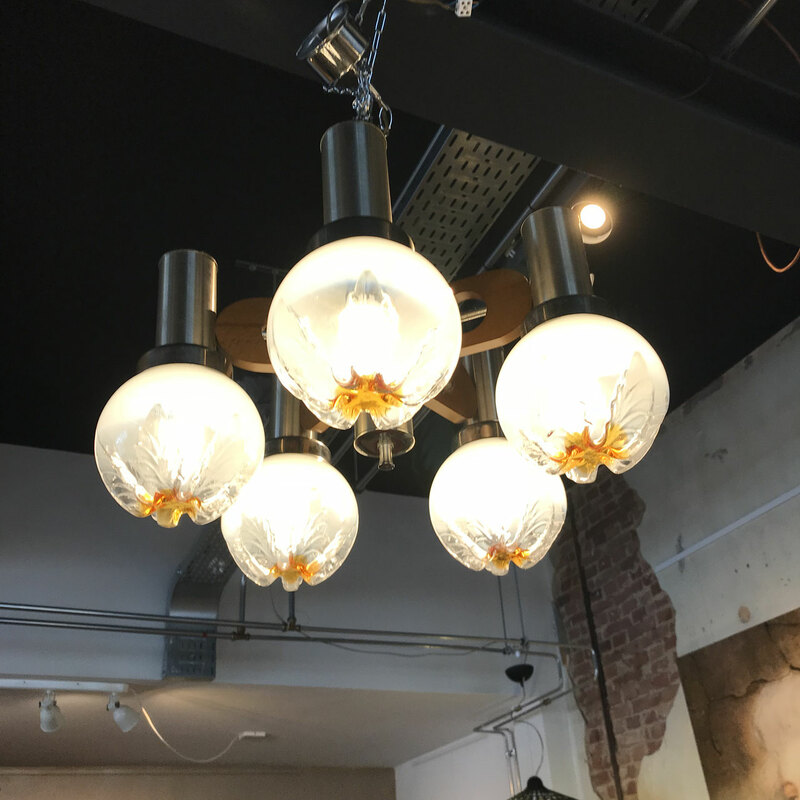 Stunning large and rare acrylic 1950s ceiling pendant light produced by Stilux Milano. 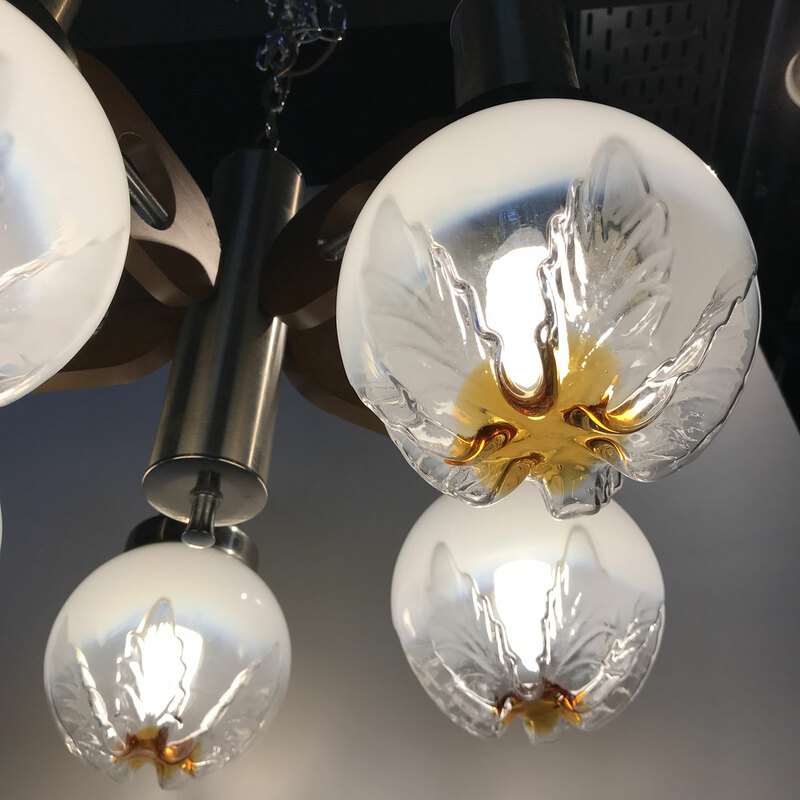 This spectacular light comprises two different shades, an outer concave Plexiglas shade in clear amber and an inner acrylic diffuser shade in opaque white. Together they create something wonderful! 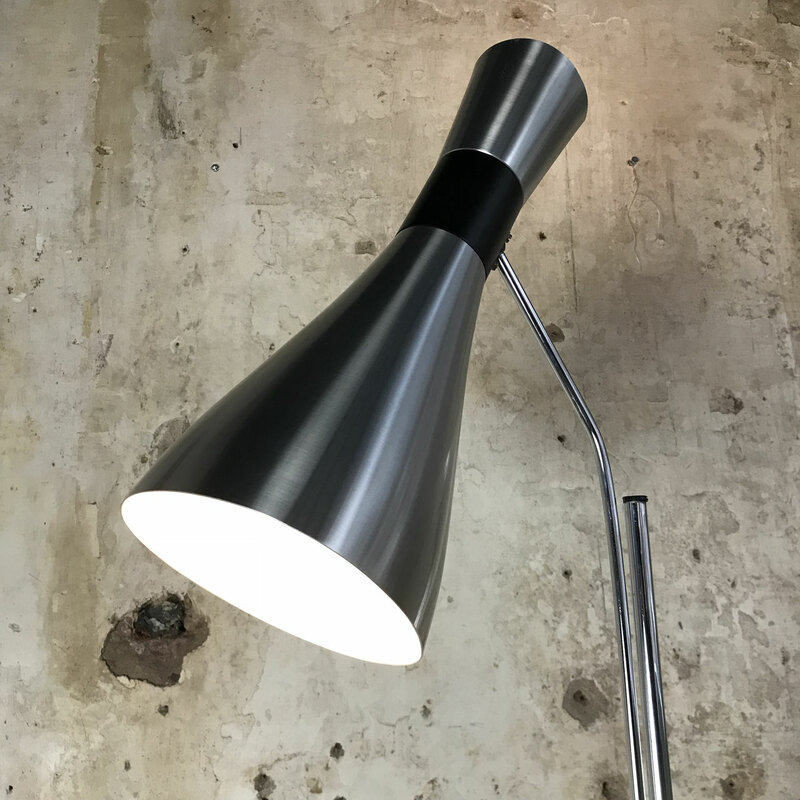 The height is adjustable, the lamp could be moved up and down using the chrome handle. The pendant is preserved in a good condition with little signs of age and use. 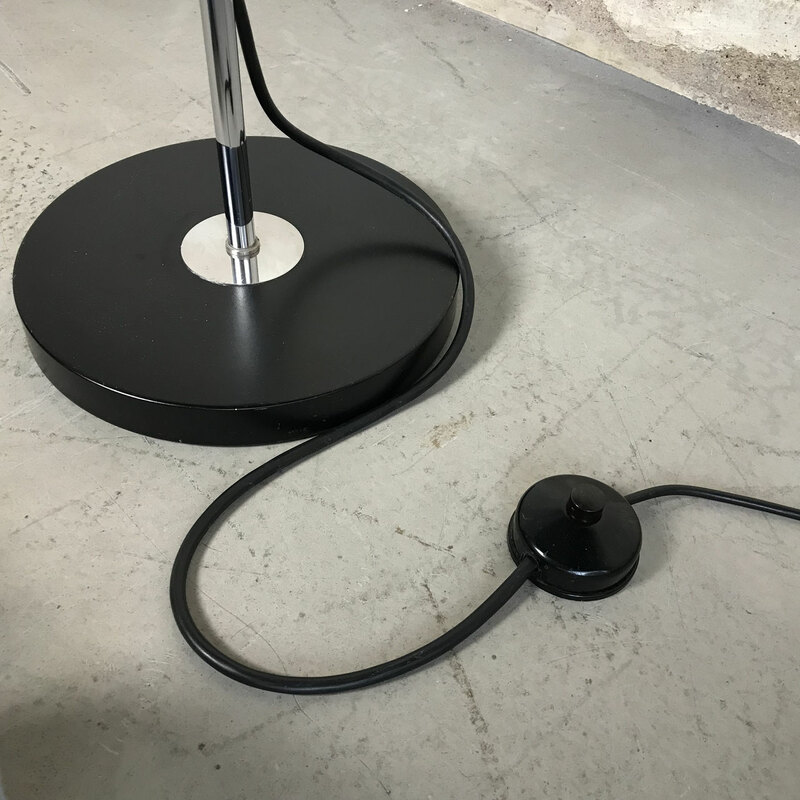 The spiral cord is in good condition and fully functional. 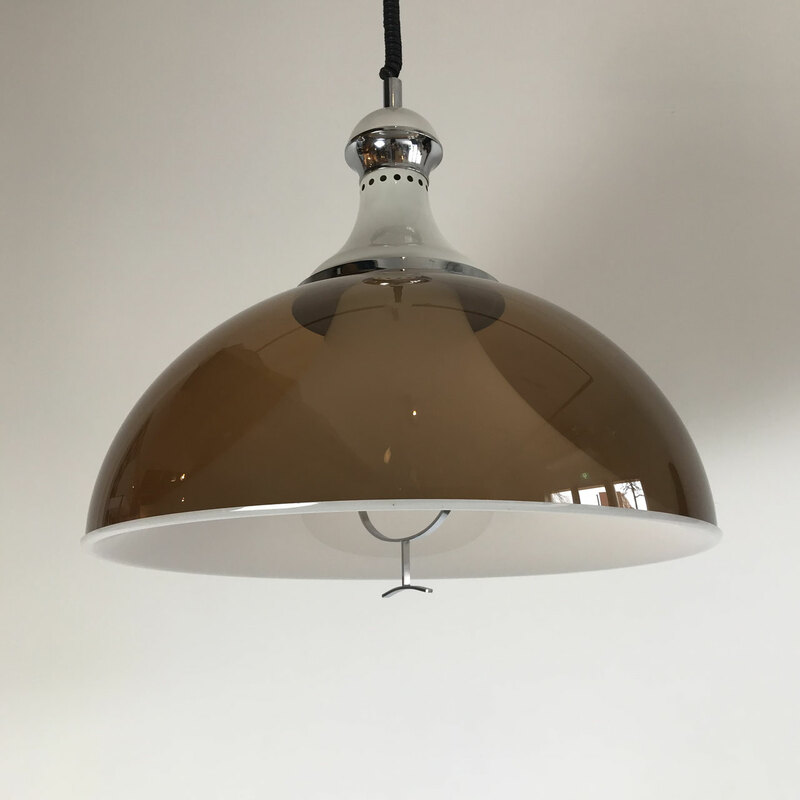 Very big, iconic pendant light from the 1970s, designed and produced by Harvey Guzzini, Italy. 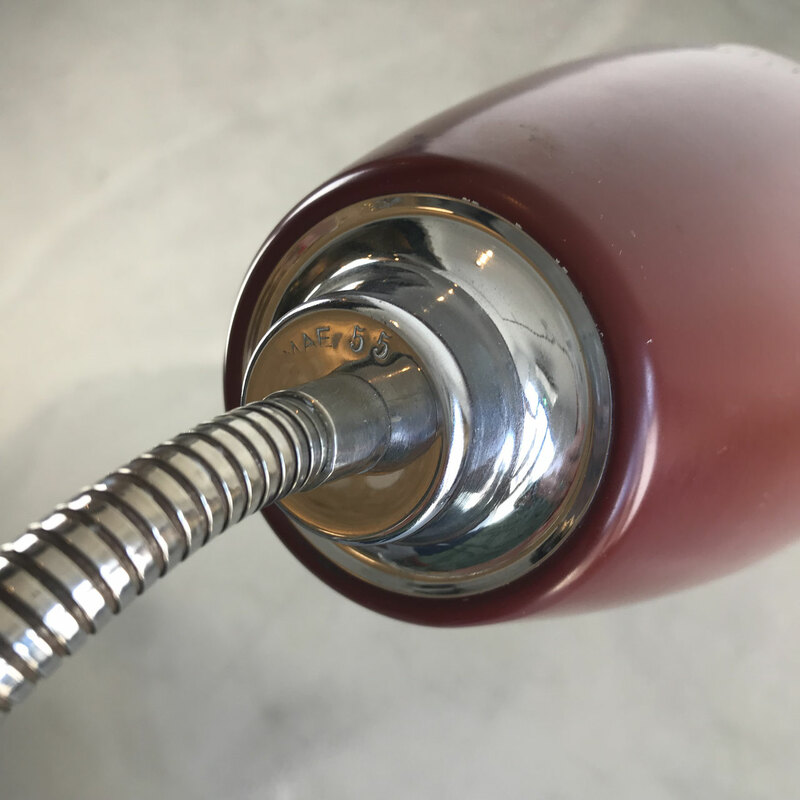 With original chromed ceiling cap, labelled. In excellent vintage condition. 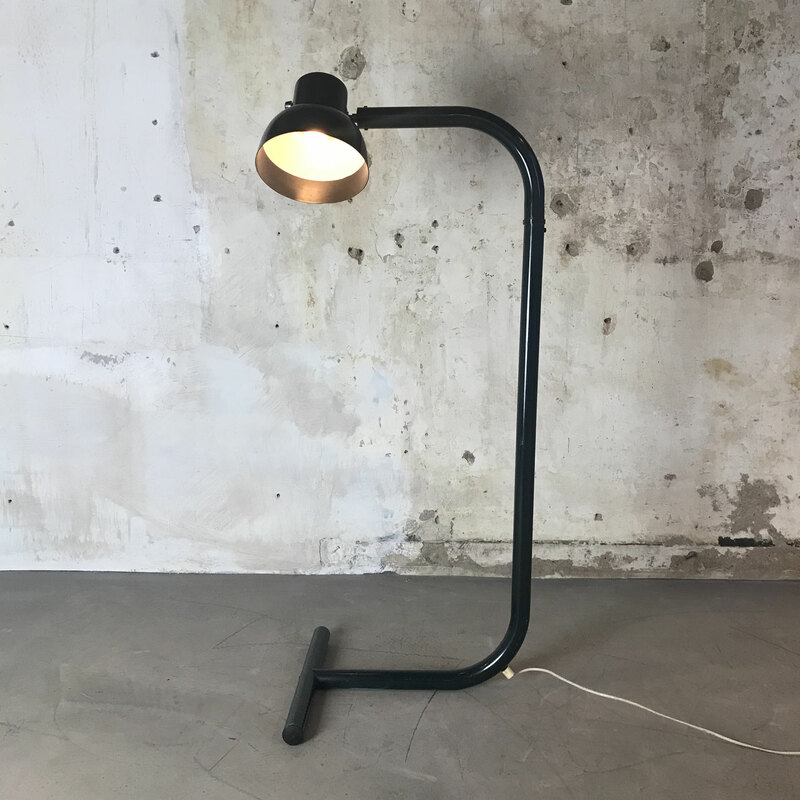 Rare and impressive vintage 'Diabolo' floor lamp by Jo Hammerborg for Fog & Mørup. Very nice Danish design from the '60s. 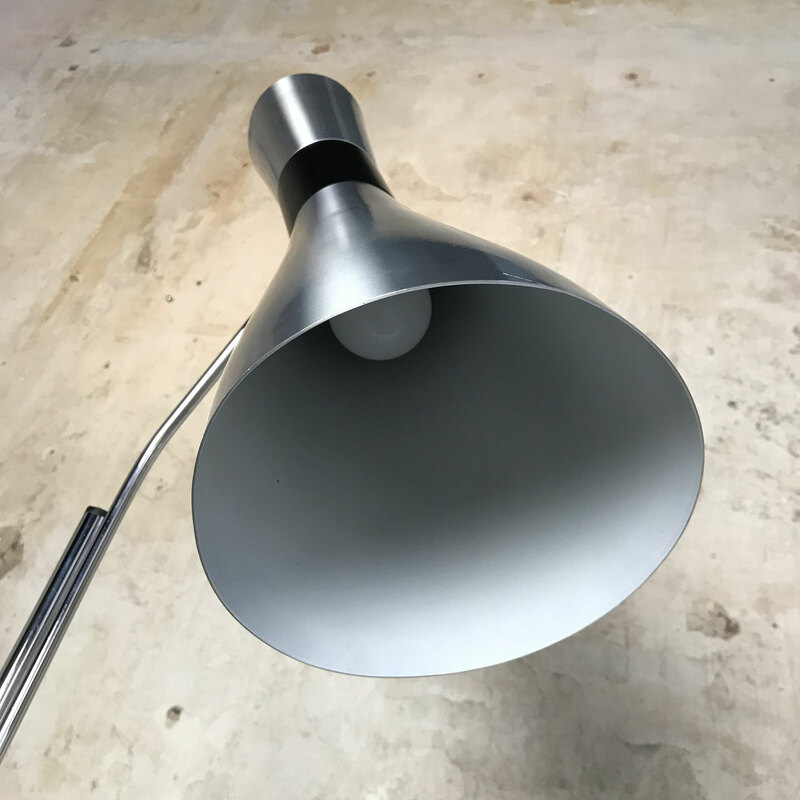 The lamp is adjustable in height and the 'diabolo' hood can point in any direction. 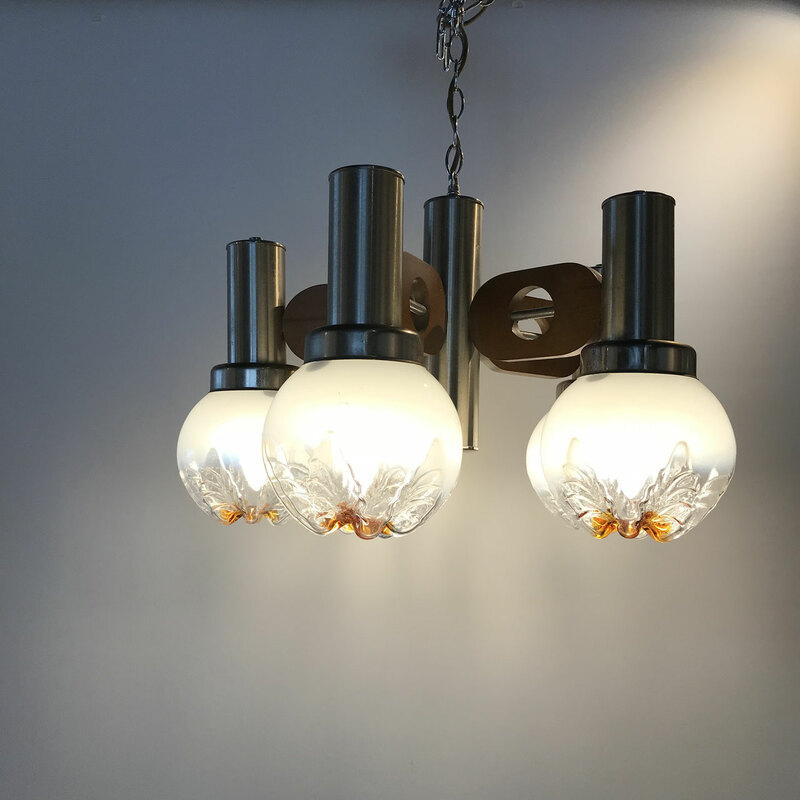 Equipped with two light sources (E27 fitting). 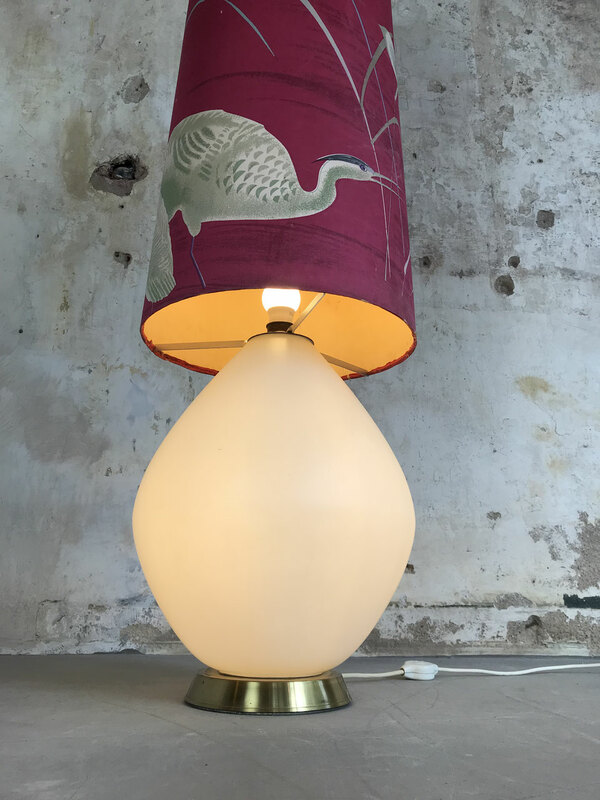 The lamp is in a beautiful original condition with slight traces of use appropriate to the age. 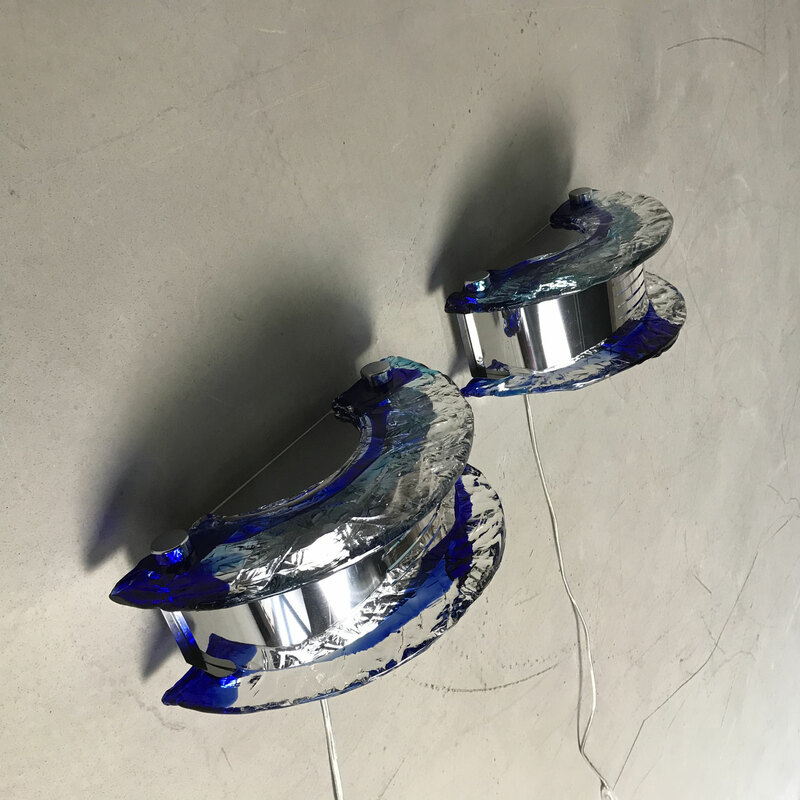 A set of two very stylish wall lamps from the 70's designed by Carlo Nason for Mazzega, Italy. 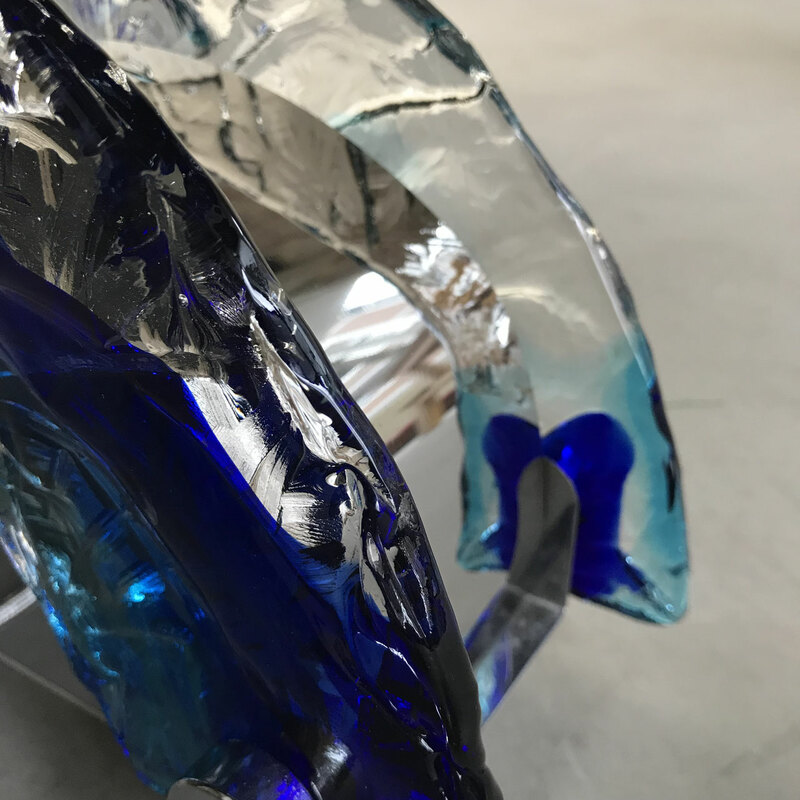 Shaped with hand blown 'paste' Murano glass in a chromed housing. Excellent condition without any noteworthy traces of use. 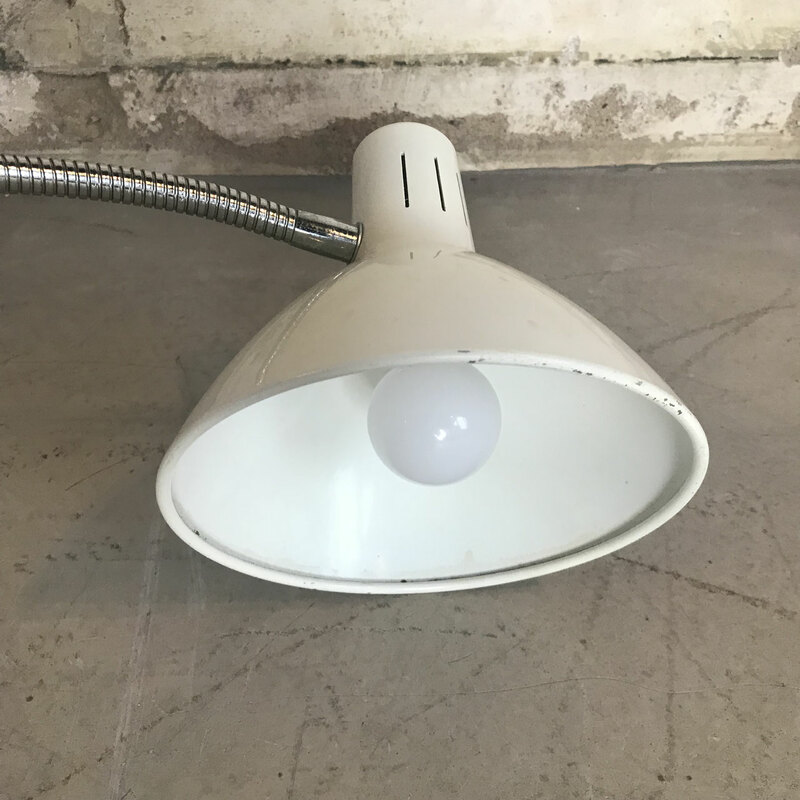 Both lamps are equipped with two E27 sockets with new LED ball lamps. 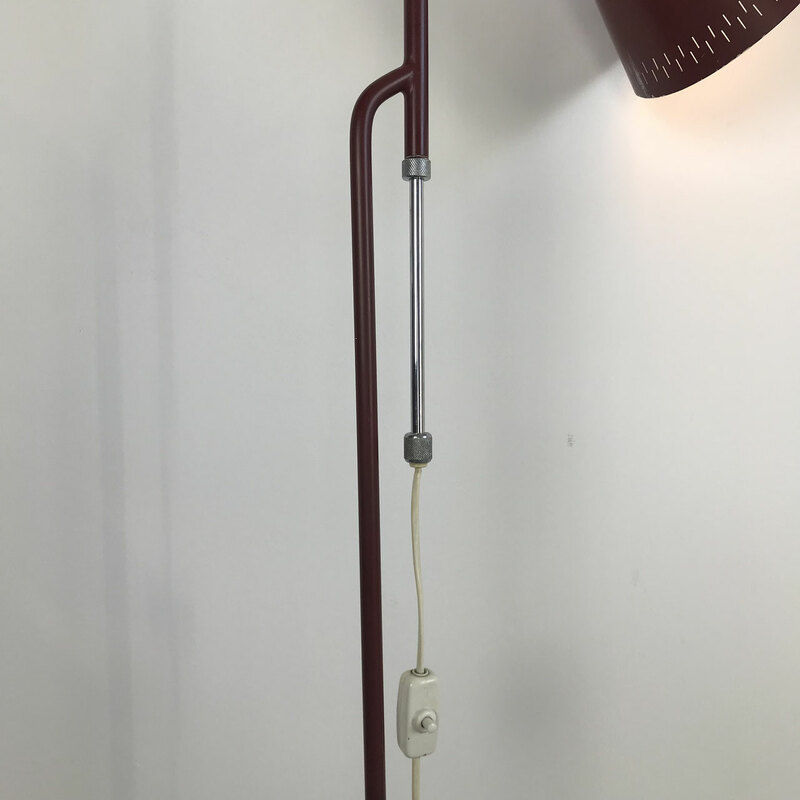 Fantastic vintage floor lamp from the 70s. 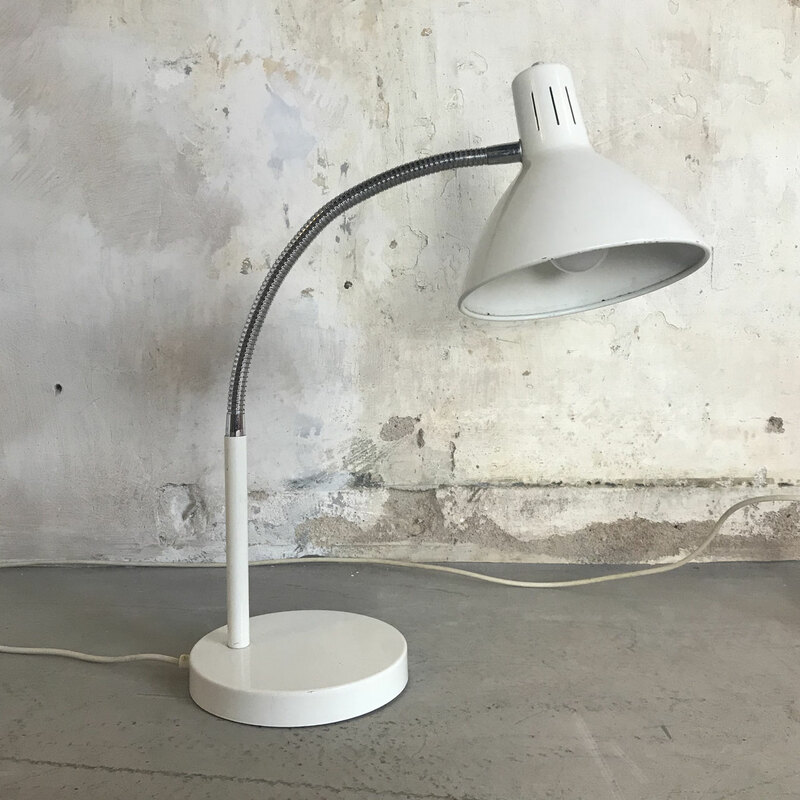 The model is called FARO and is a design by Harvey Guzzini, Italy. 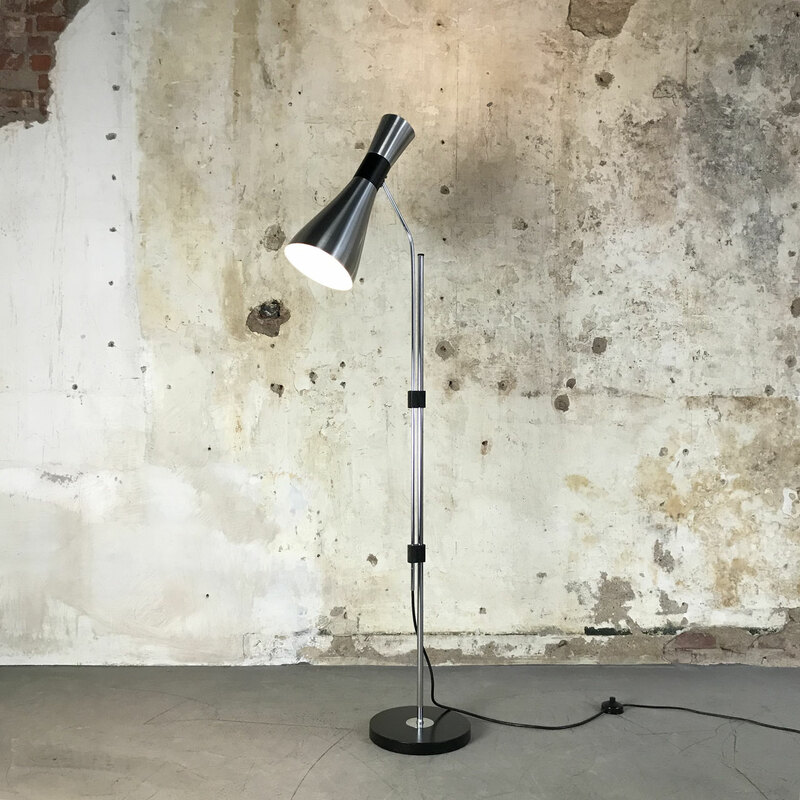 As a floor lamp, the FARO was only in production from 1970 to 1976 and is therefore rarely offered. 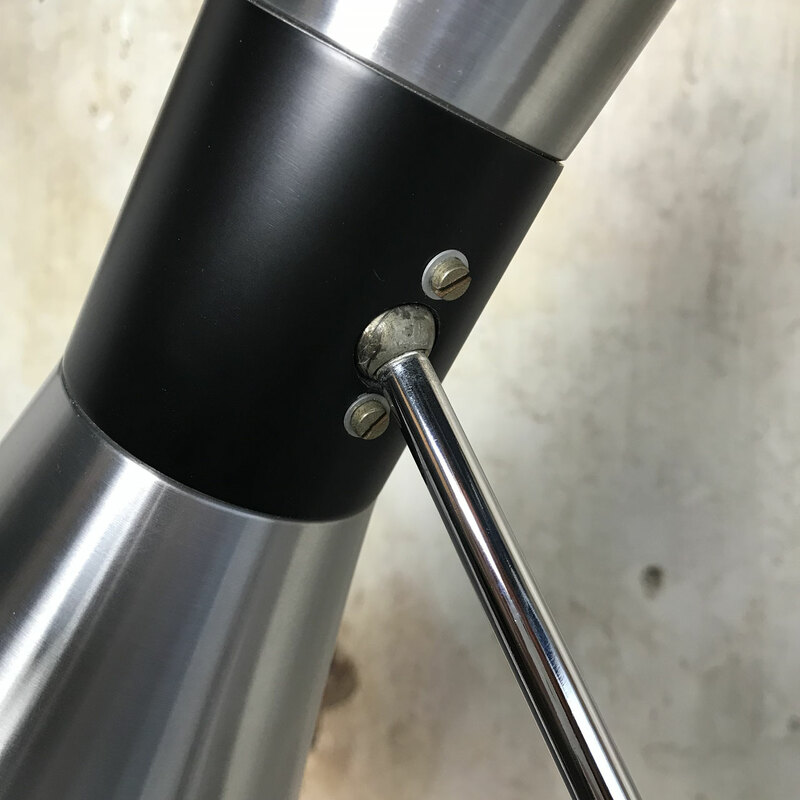 Height adjustable hood with two E14 sockets, chromed base and switch. 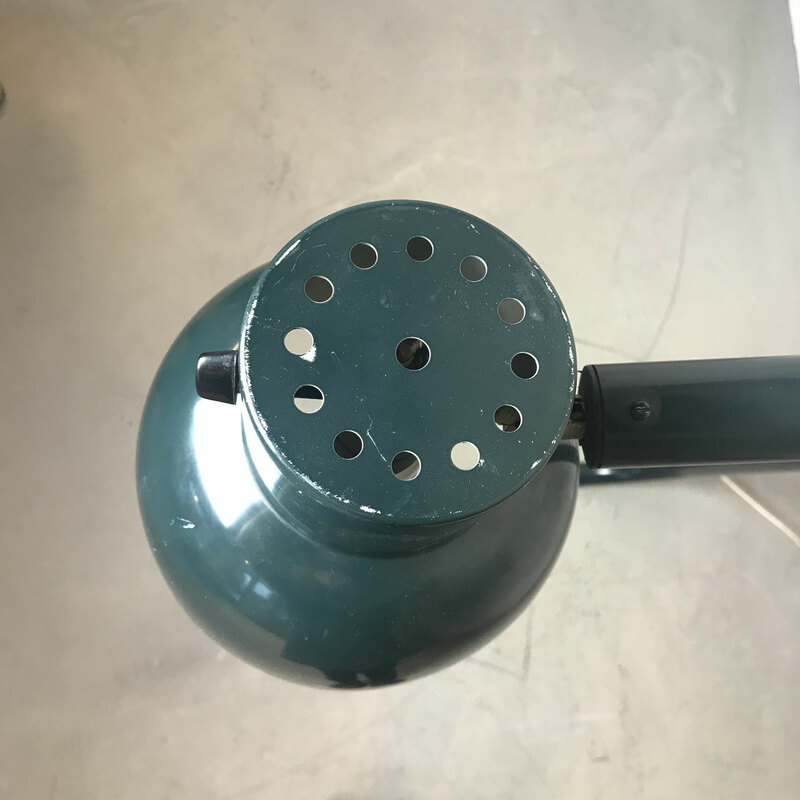 Completely in original condition with very few traces of use. Marked! NB. 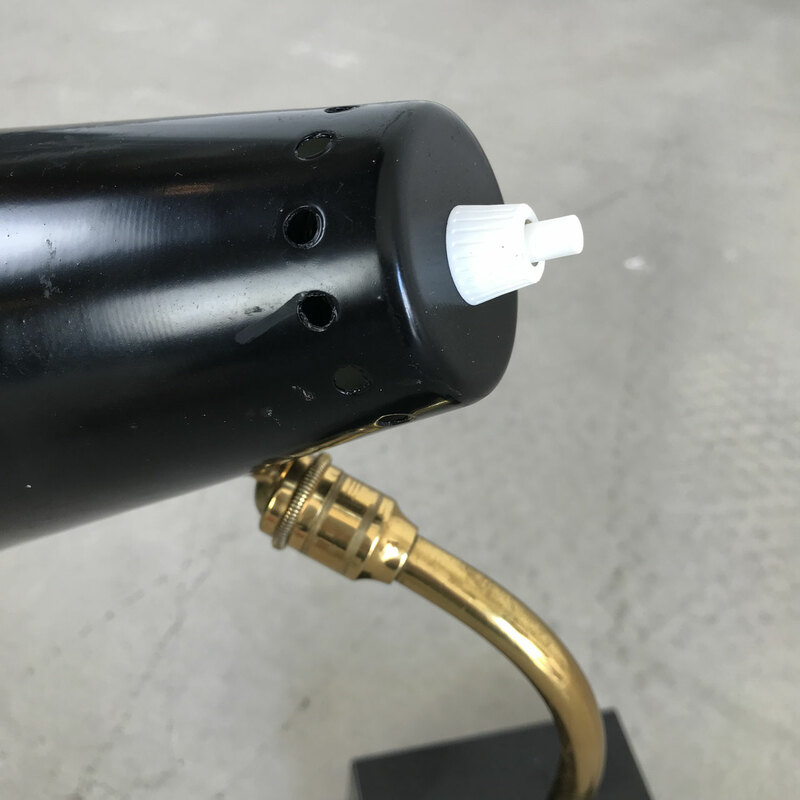 The Faro lamp is used as a props in the 9th James Bond movie "The man with the Golden Gun" from 1974. 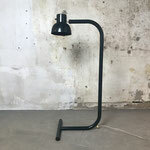 Very cool industrial floor lamp from the 60's, nice example of vintage Scandinavian design. Designed by Hans-Agne Jakobsson for AB Markaryd Sweden. 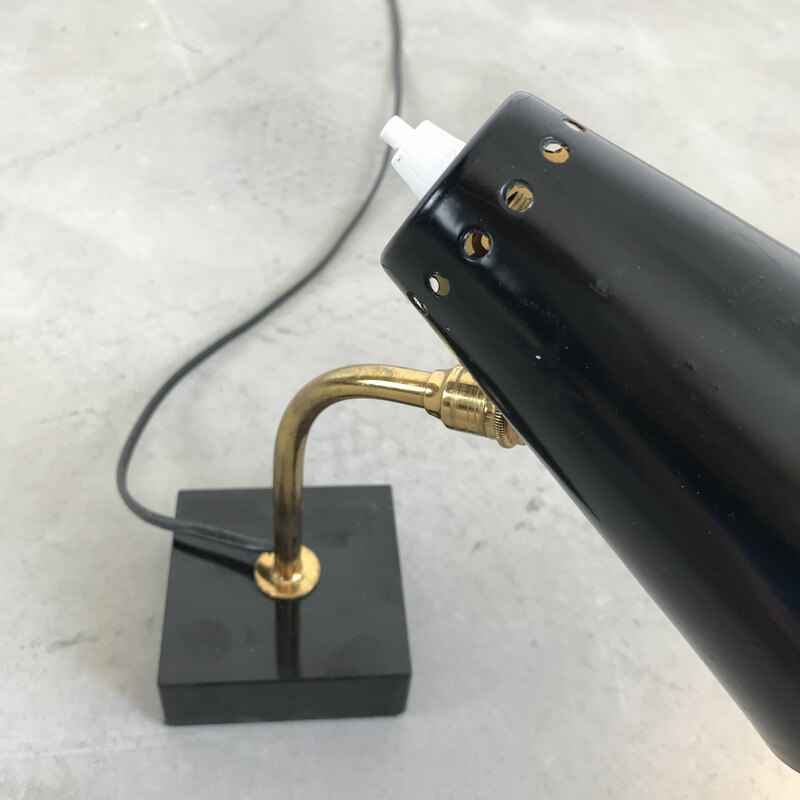 The large spot can be adjusted in every possible way and is equipped with an original (working) switch. Beautiful vintage condition! Nice metal vintage desk lamp from HALA Zeist from the 70s. 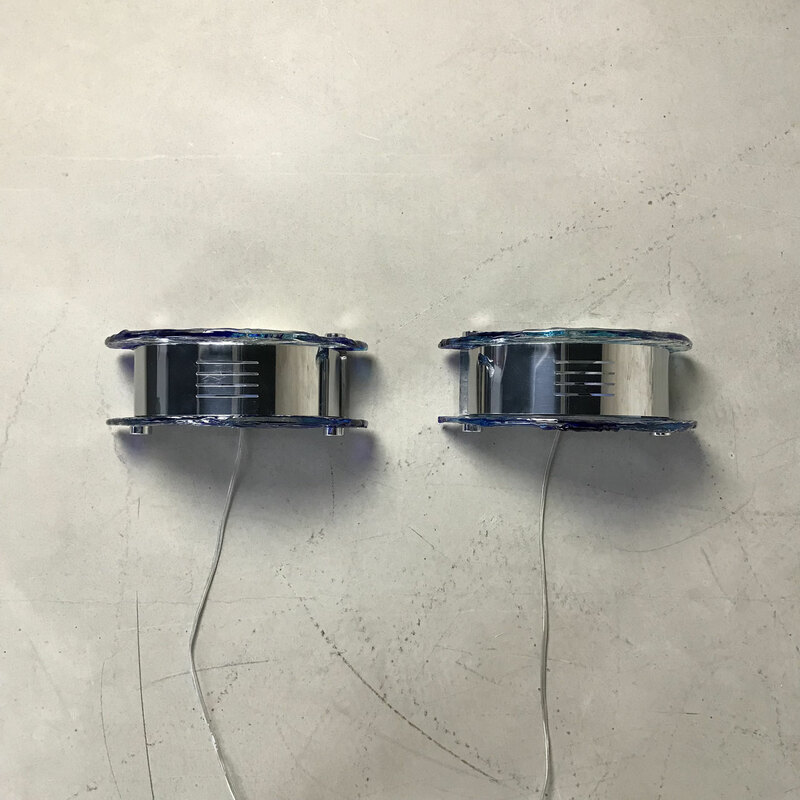 Beautiful adjustable 'neck', color white. Completely in original condition, few traces of use. 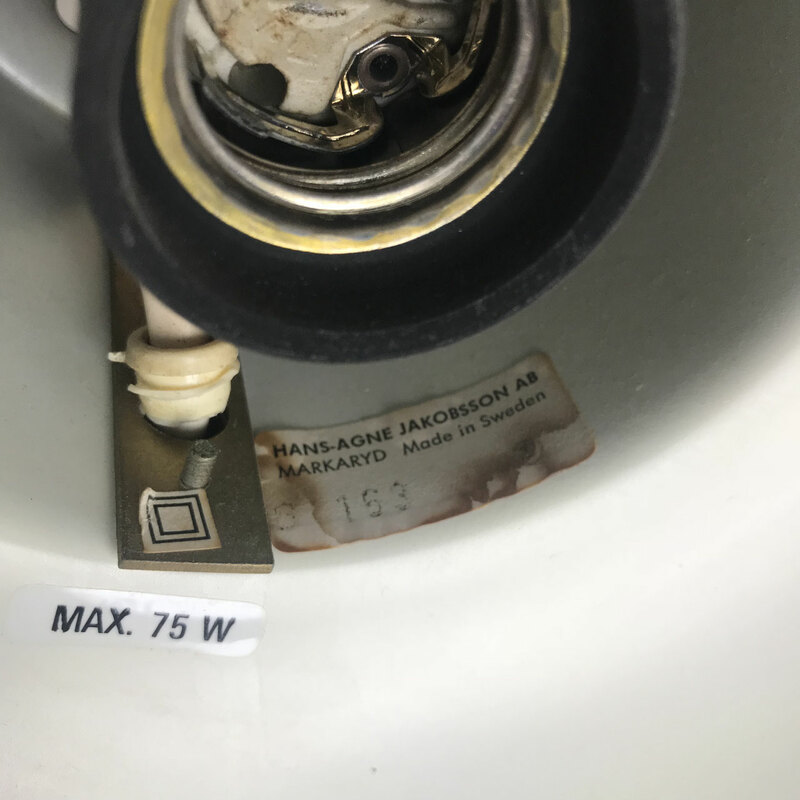 The lamp is marked. 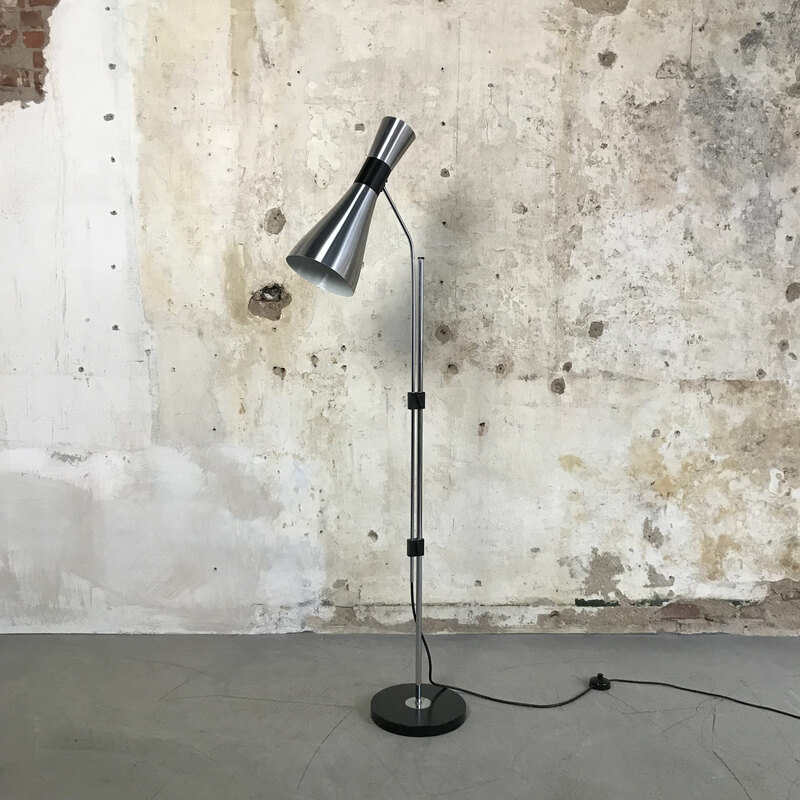 Very large and rare table lamp produced by Dutch company RAAK Amsterdam in the late 60s - early 70s. This deceptively simplistic lamp was only in production for a very short period. 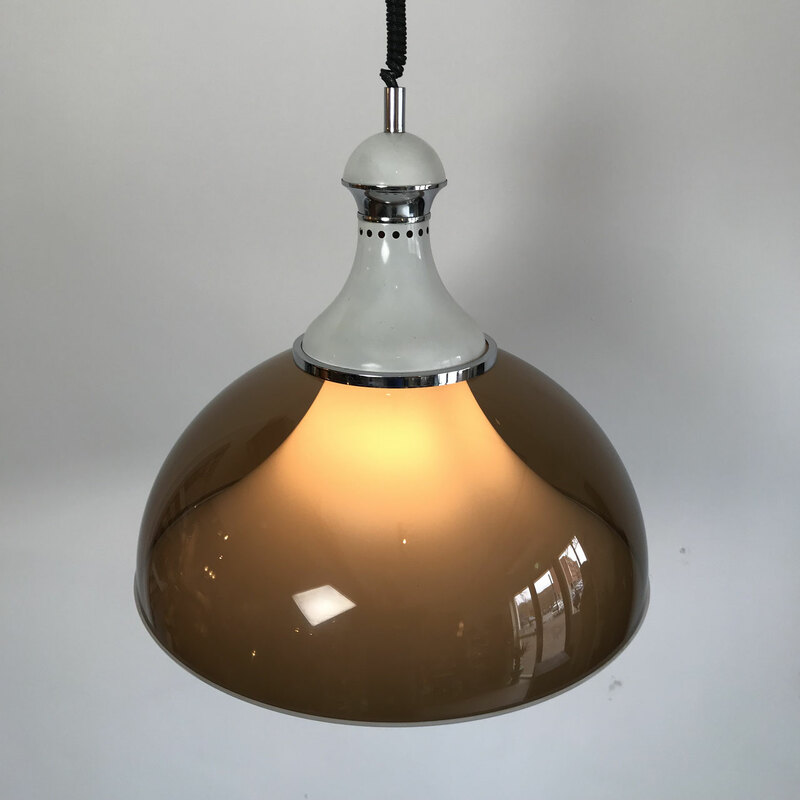 This lamp has an opaque white Perspex acrylic shade which is suspended from the chromed and very heavy metal base which is blackened at the top. 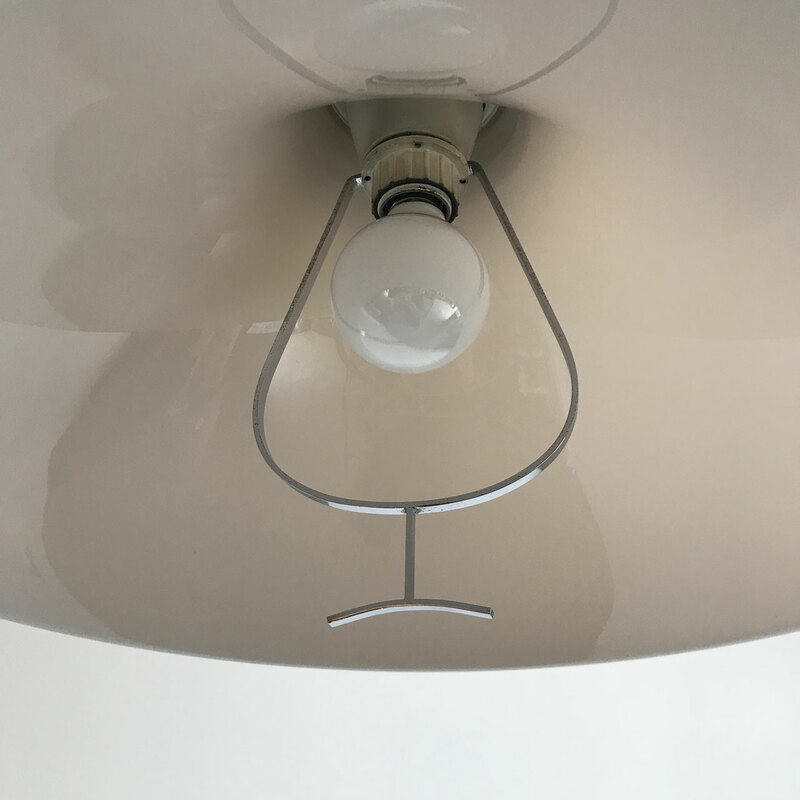 It has two light sockets (E27). Marked insight. Fabulous timeless Dutch Design in the style of the ‘Snow’ lamp by Vico Magistretti for Oluce. 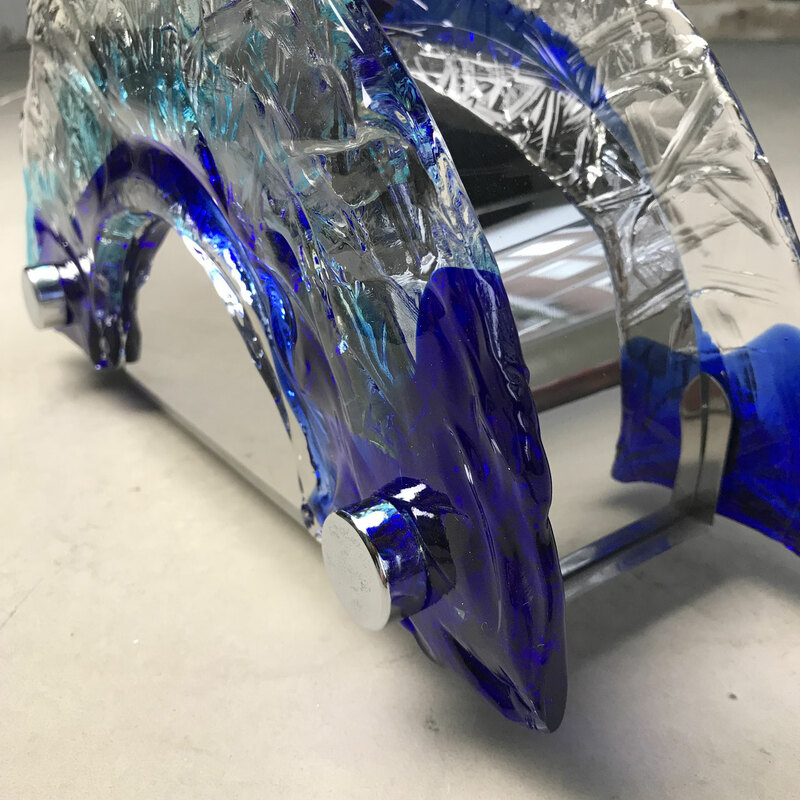 Bright, colorful, semi transparent. The Agaricon is a luminous mushroom that gives the impression that the light within breathes. 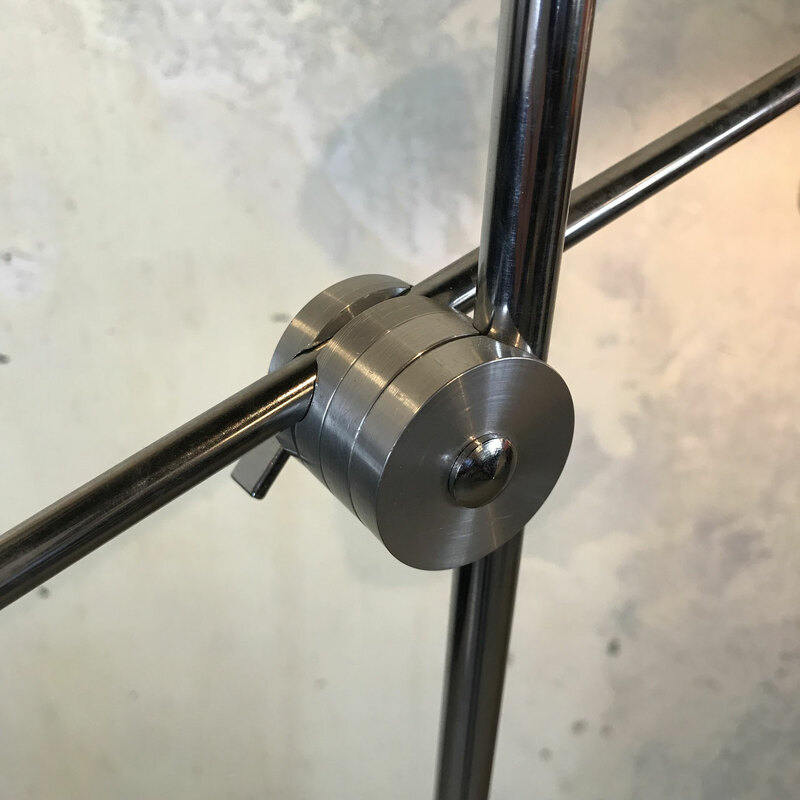 This lamp is switched on by touching the aluminum ring. 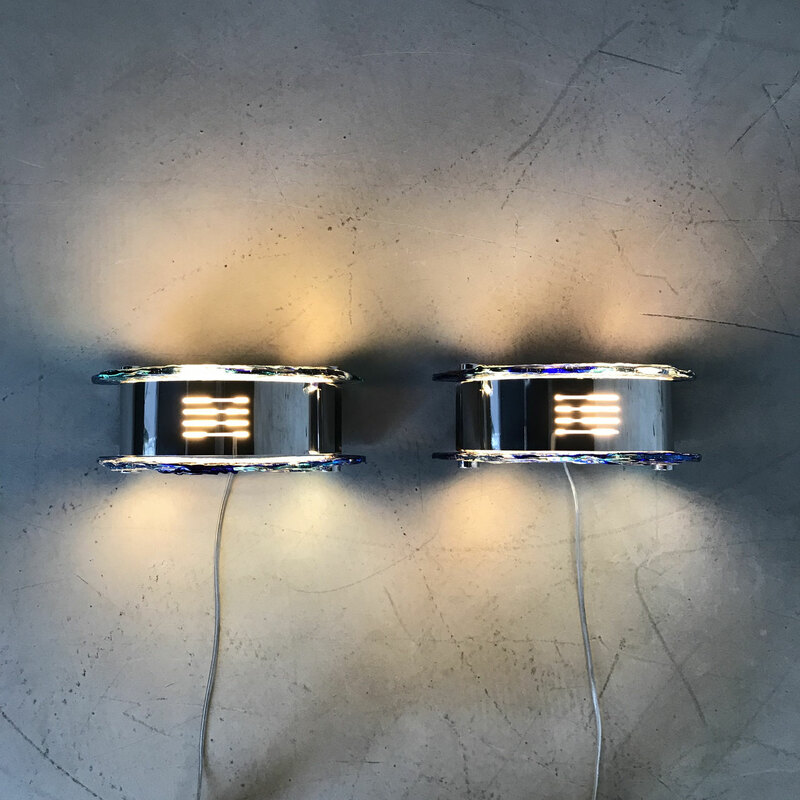 With this ring you can also regulate the light intensity (touch-dimmer). 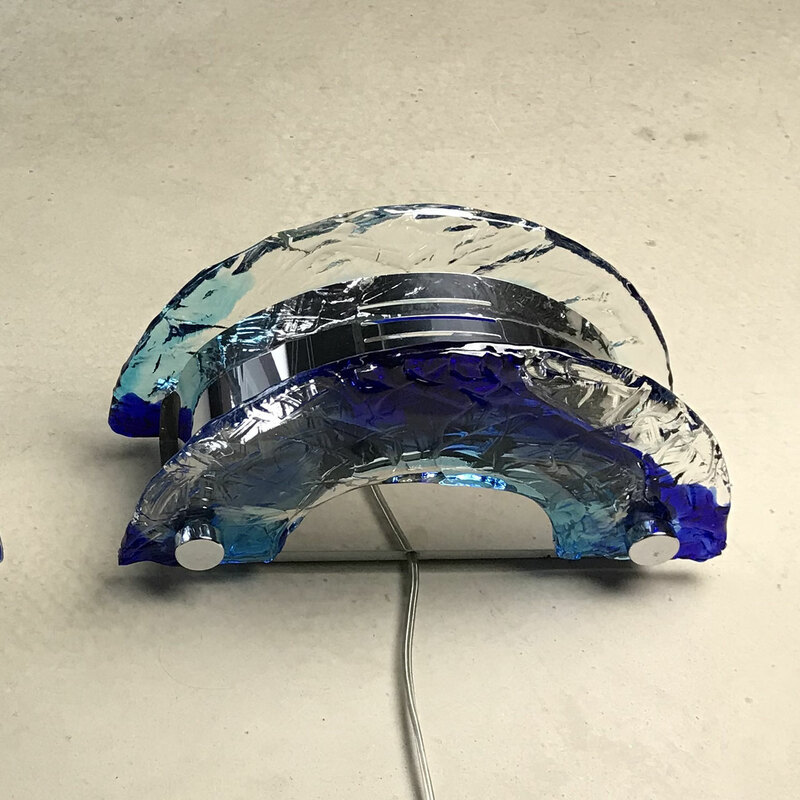 Made of coloured polycarbonate. 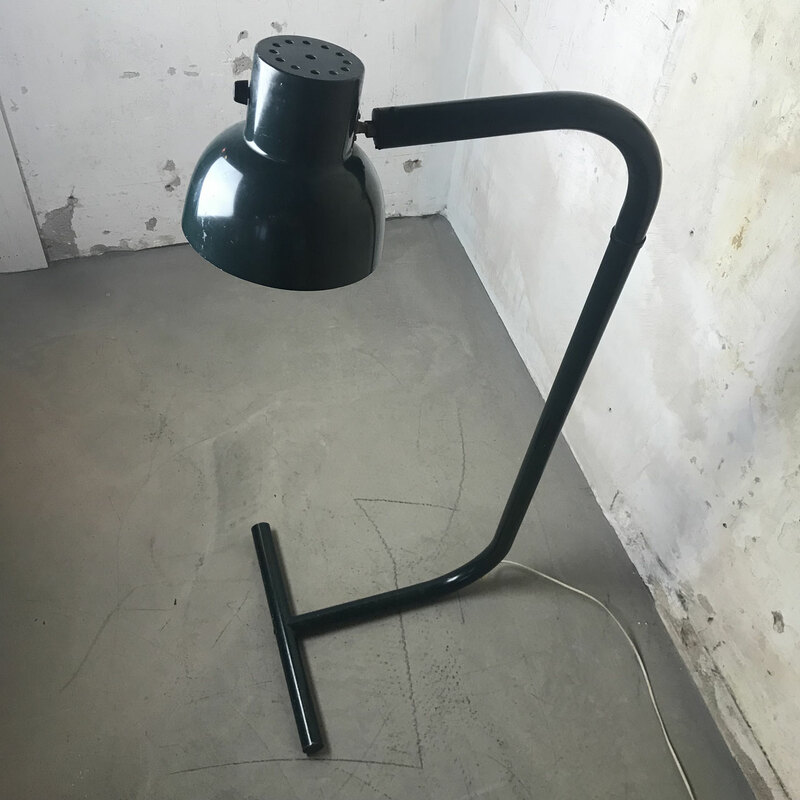 Industrial, vintage Danish Architect Desk lamp by Poul Henningsen from the seventies for Louis Poulsen. 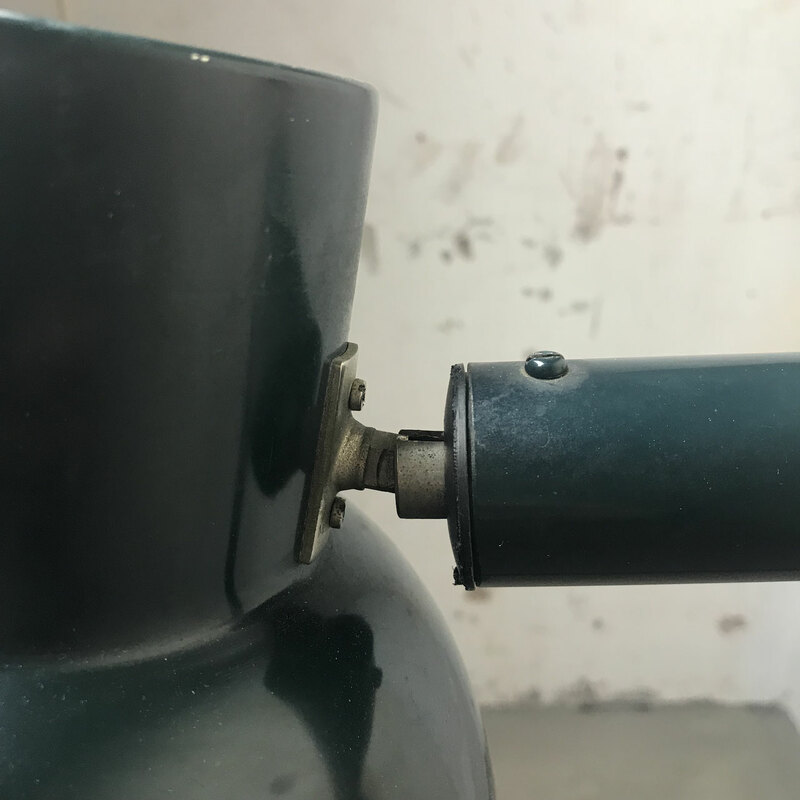 Small traces of use (see photos), but fully functional. 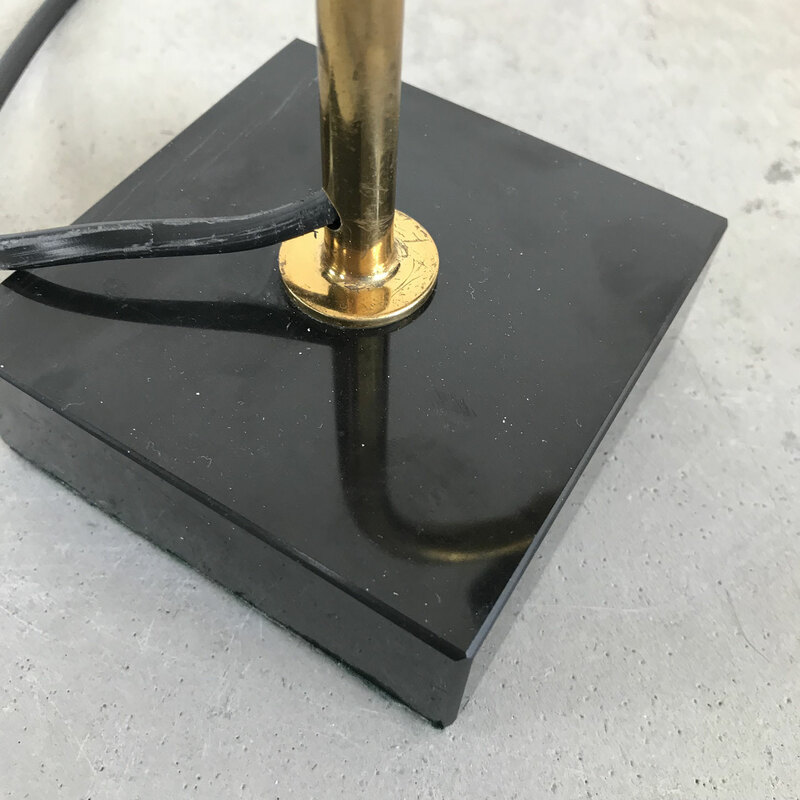 Beautiful, heavy cast iron base. 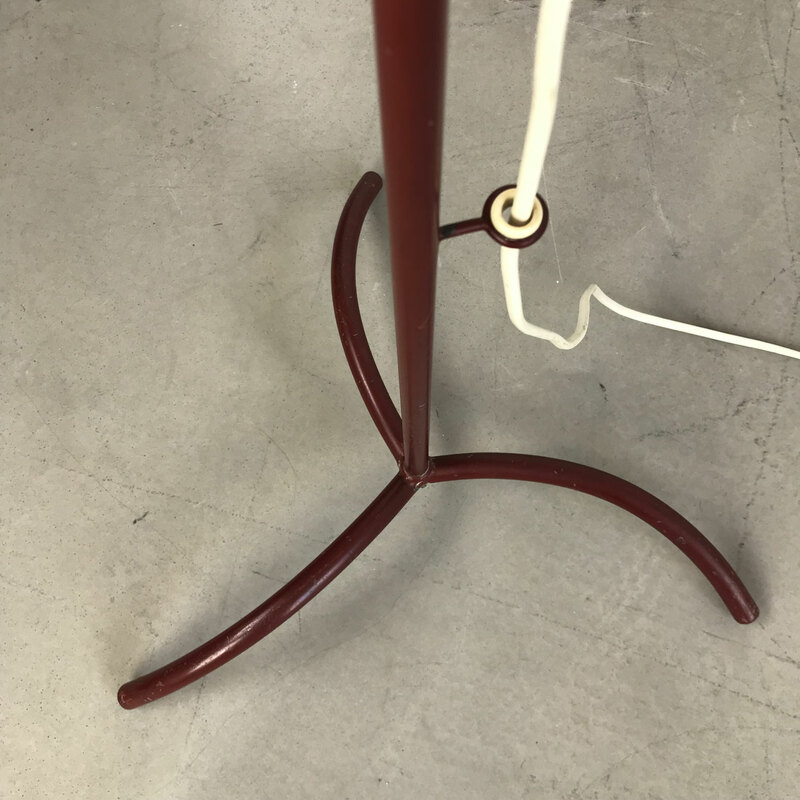 Rare Italian floor lamp Targetti Sankey, 1970s. Impressive floor lamp designed in 1965 by Elio Martinelli. 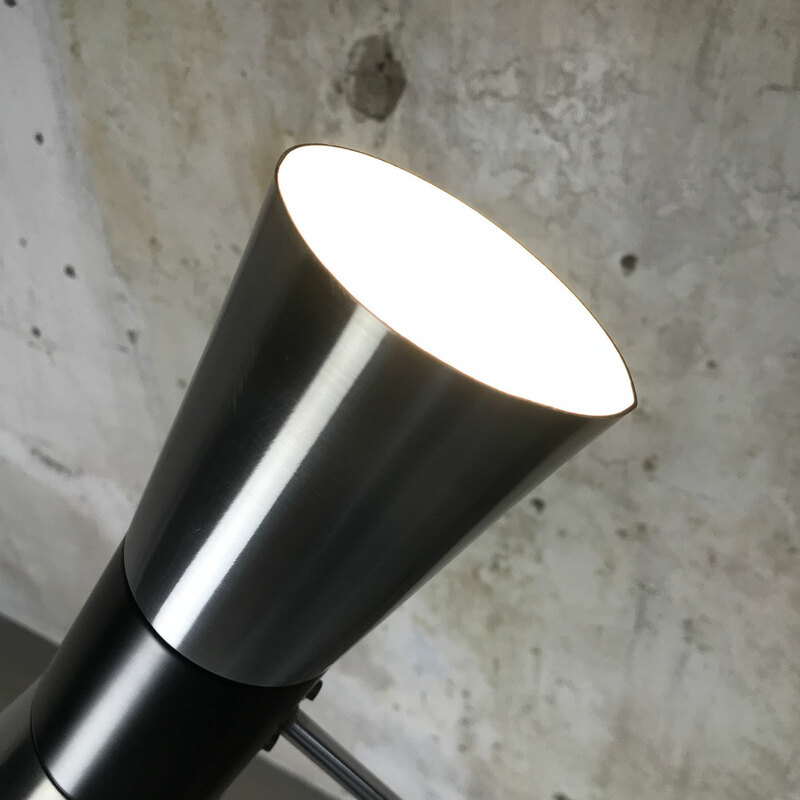 With swing arm, white opal methacrylate diffuser and a metal frame. The lamp is made of methacrylate molding techniques, very innovative for the time in which it was designed. 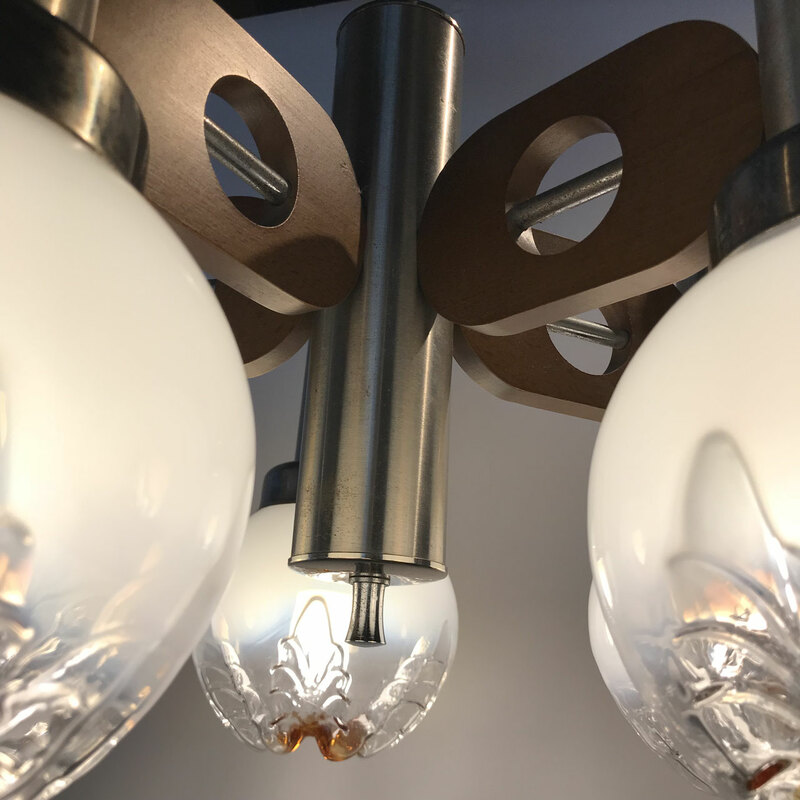 Its geometric shape and dynamism revives the admosphere of those years decisive for the success of the design italian in the world. 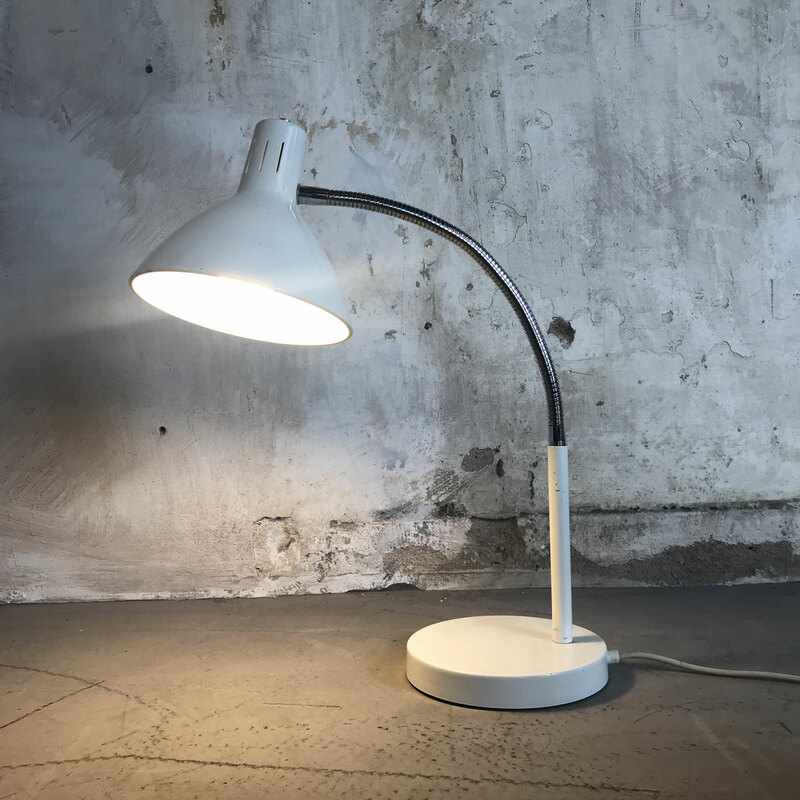 "Relemme" pendant lamp by Achille and Pier Giacomo Castiglioni for Flos. 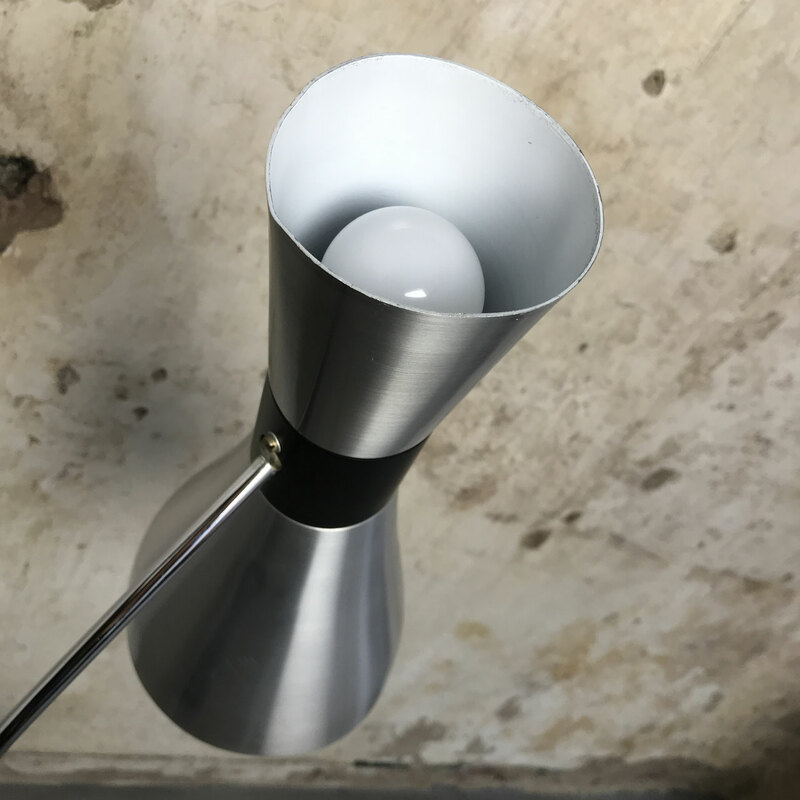 Enameled spun aluminium shade, fitted with a silver domed reflection bulb. Lower rim fitted with black rubber strip for protection. 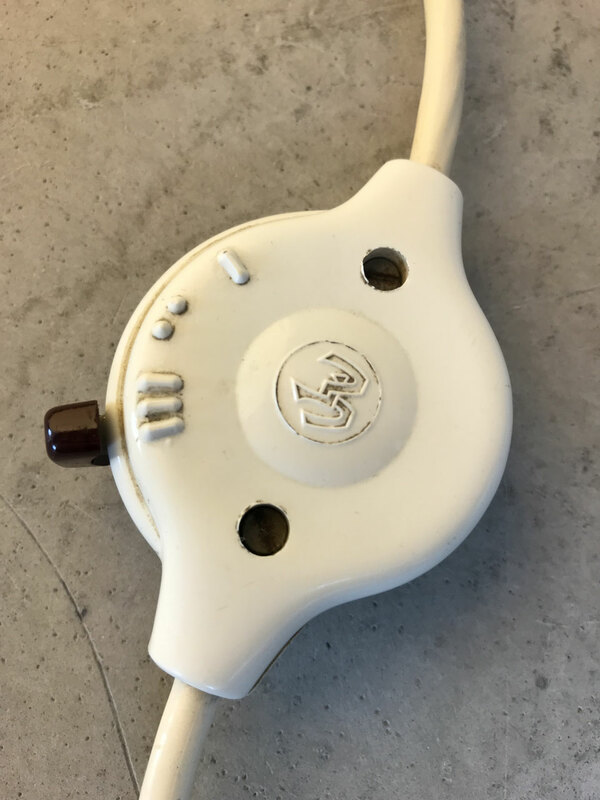 Complete with original cord, ceiling cap and Flos sticker. The Relemme is part of the permanent collection of The Museum of Modern Art in New York. 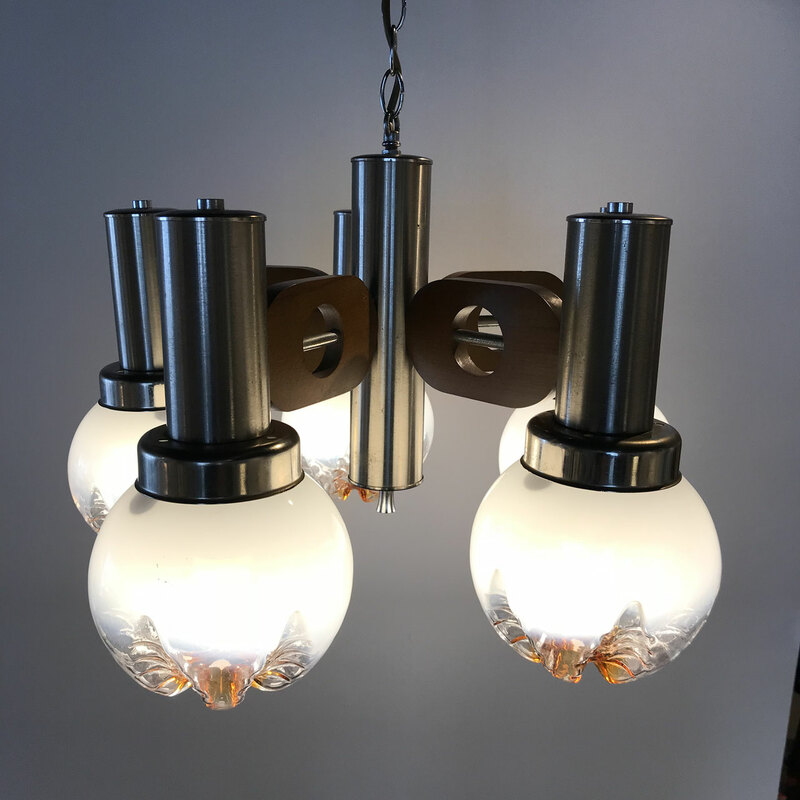 Great and elegant vintage chandelier by Italian designer Mazzega, featuring his signature white to amber artistic handblown glass globes. 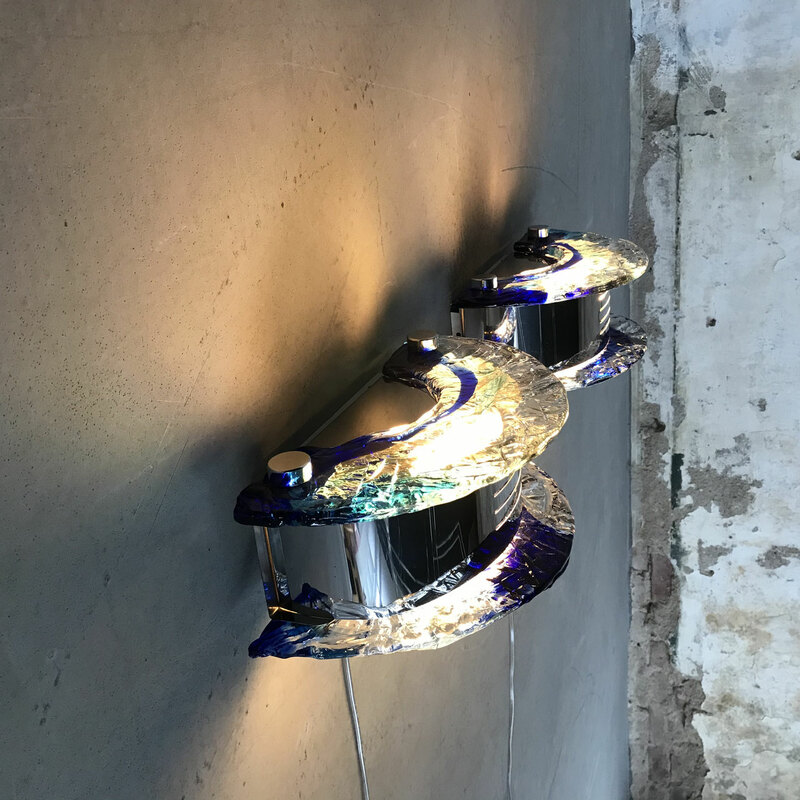 Five Murano glass balls situated on a tubular chrome base and connected with wooden rings on a long chrome pole. 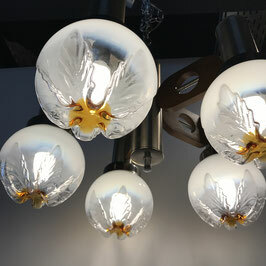 Pretty soft light, very beautiful decorative effect. 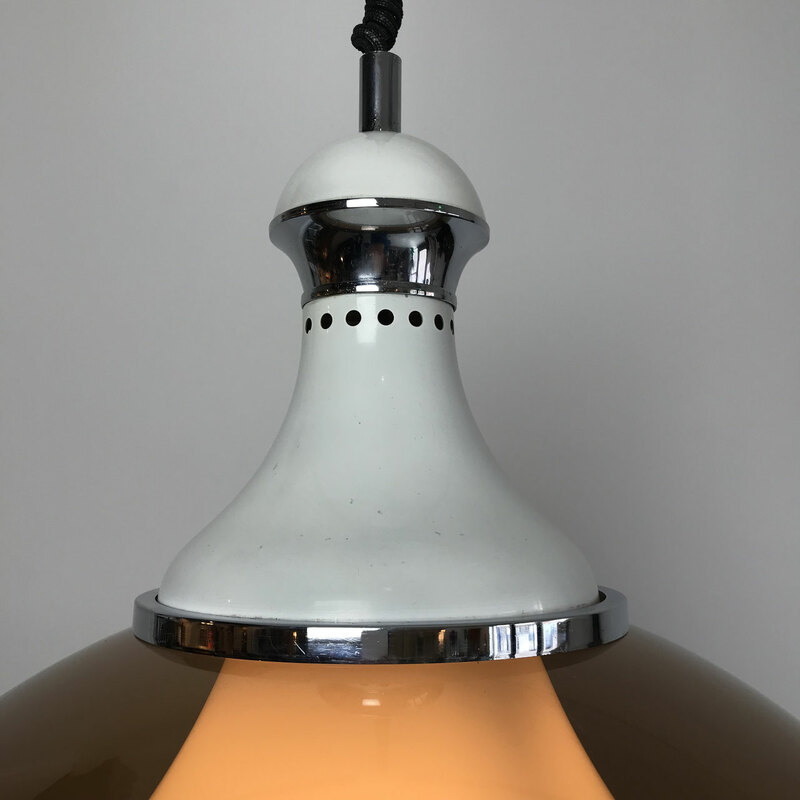 Excellent vintage condition with original chain and ceiling cap, no chips, cracks or bruises. 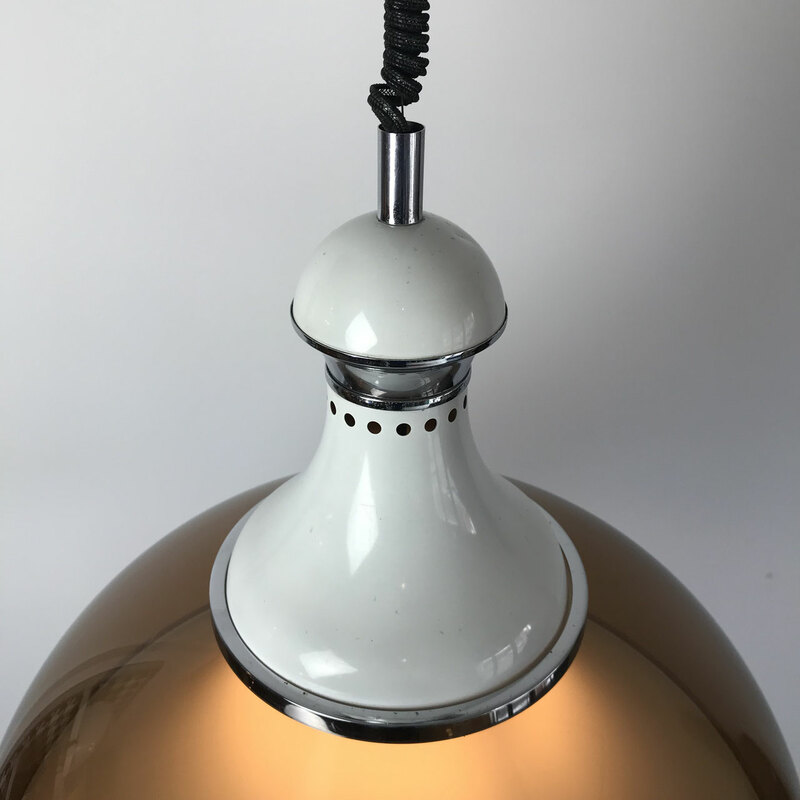 Original and rare vintage pendant by Bent Nordsted for Lyskaer Belysning in white lacquered finish. 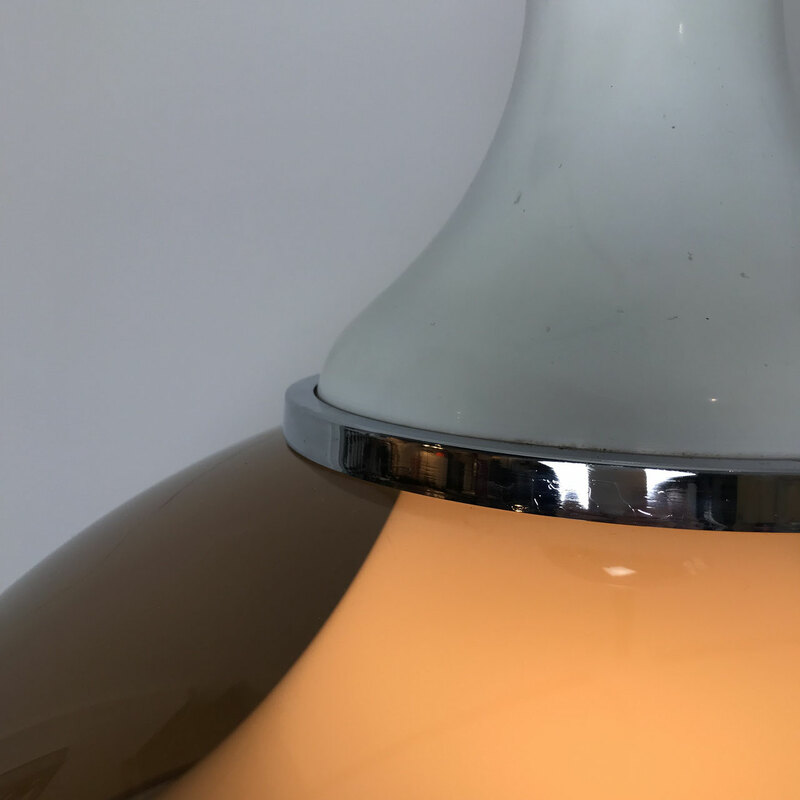 The chrome ring is orange painted inside and gives a wonderful warm effect when lit. Excellent condition. New electrics has been installed. 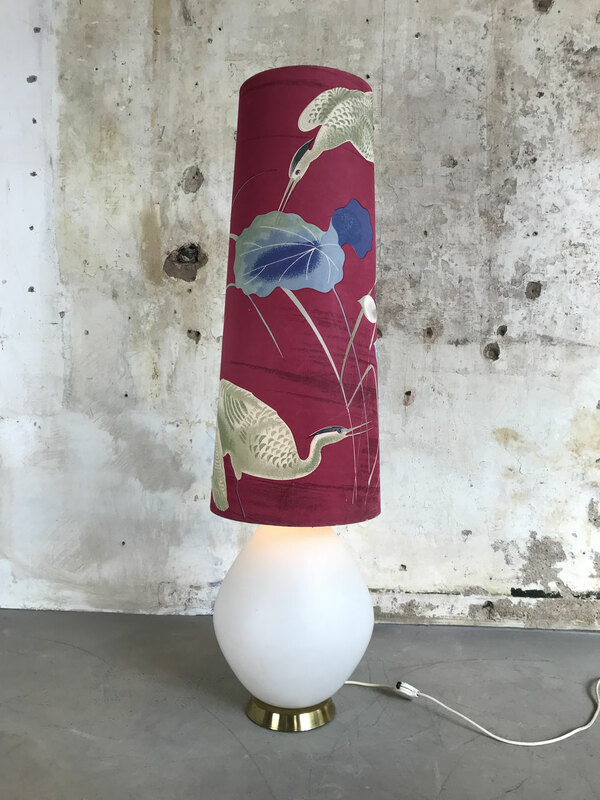 This is a lovely, stylish vintage floorlamp with a very funky look. 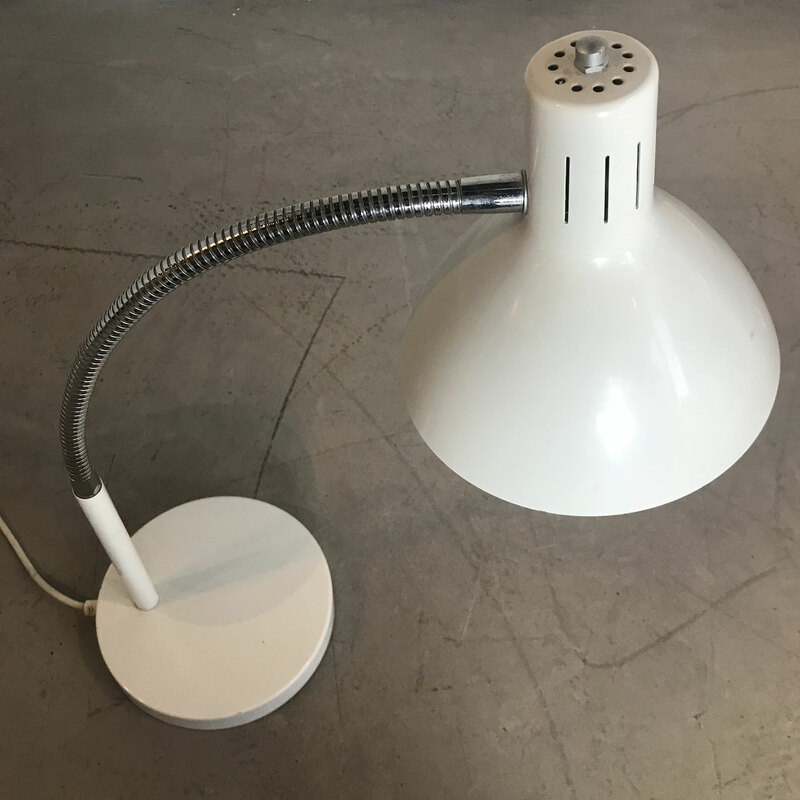 Designed by Walter Gerhards in West Germany. It has shades of orange, lime green, brown and grey within the glaze. All in good condition. 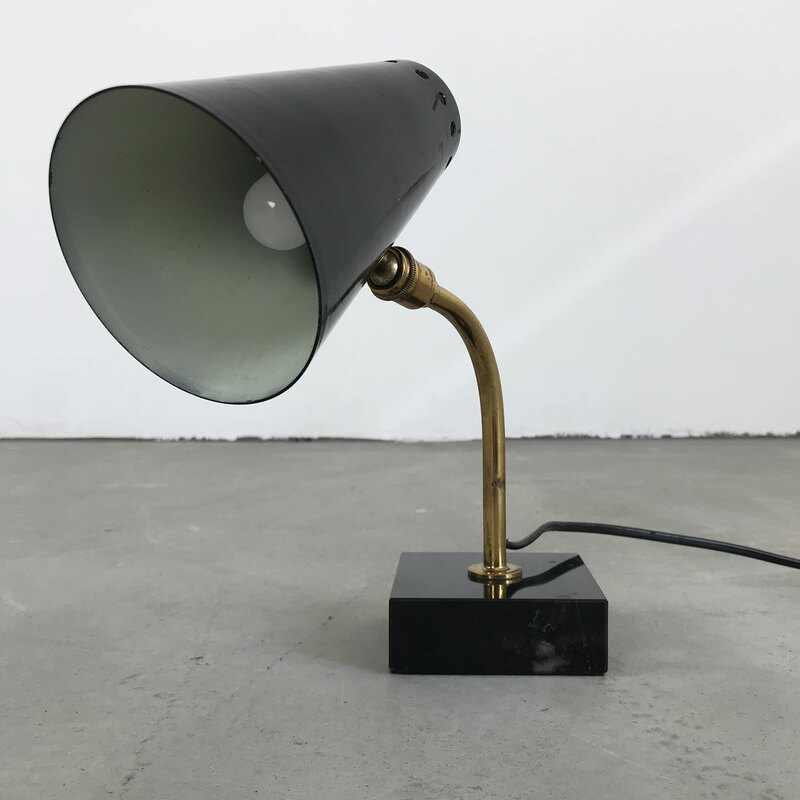 Fully working, with a bulb in the base as well as top. 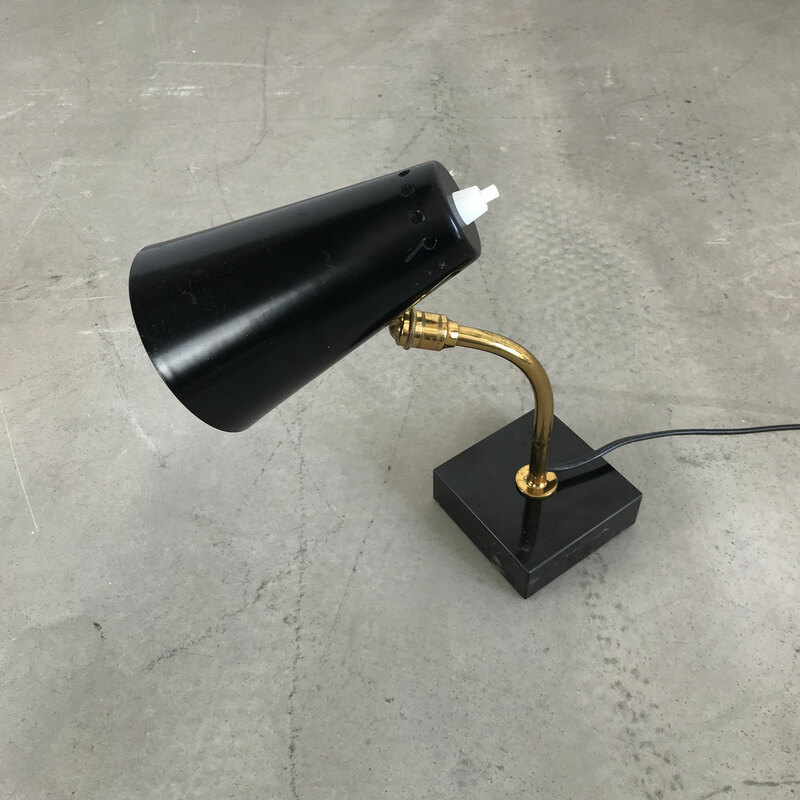 Large and rare table lamp produced by the Dutch company RAAK Amsterdam in the late 60s - early 70s. 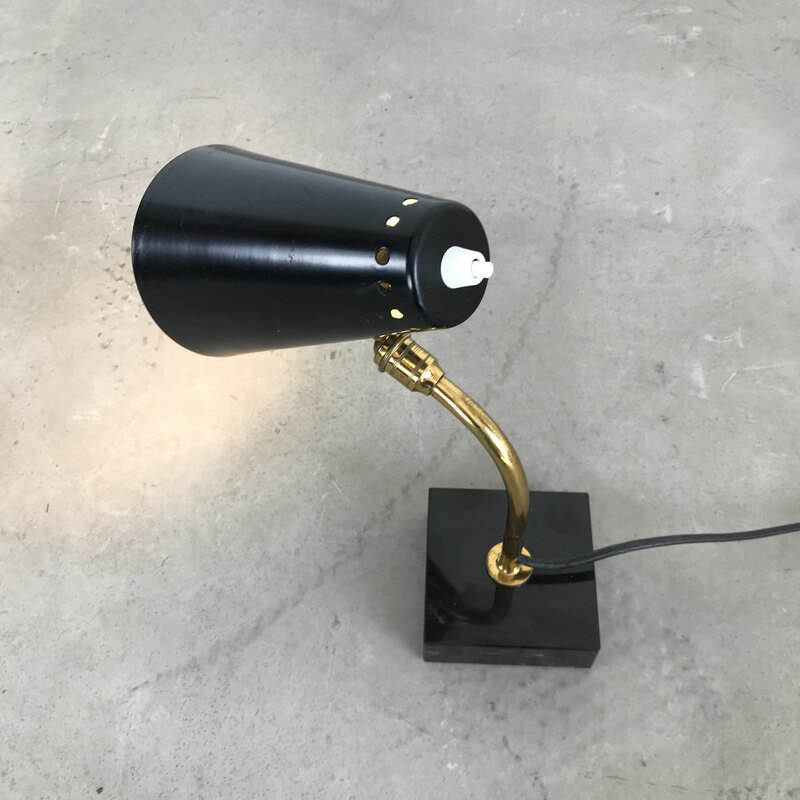 The lamp has a cast iron base with a chrome rod on which the original shade is mounted. 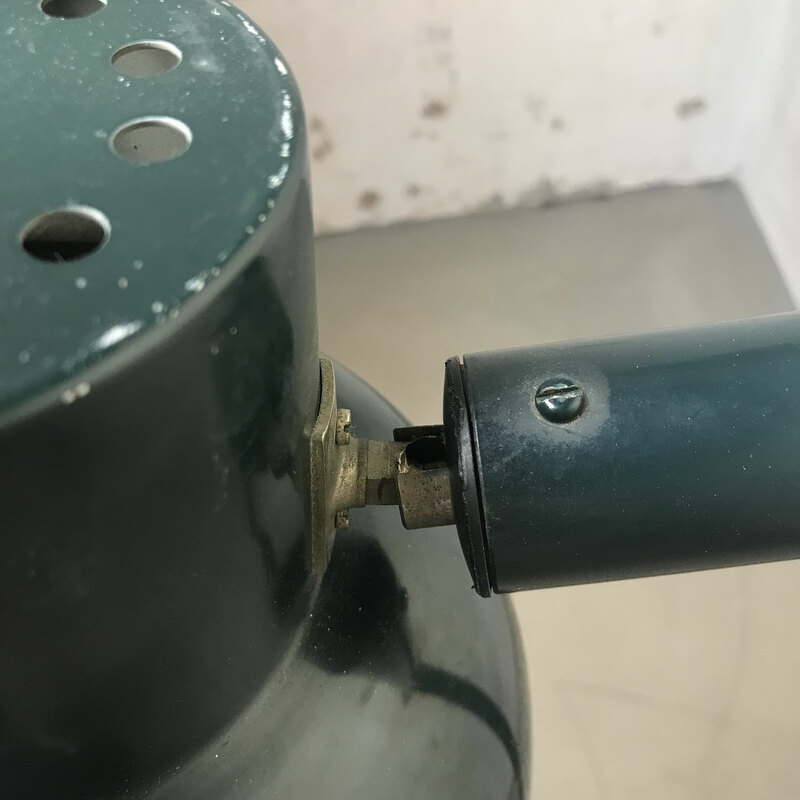 The top is covered with a white metal plate. 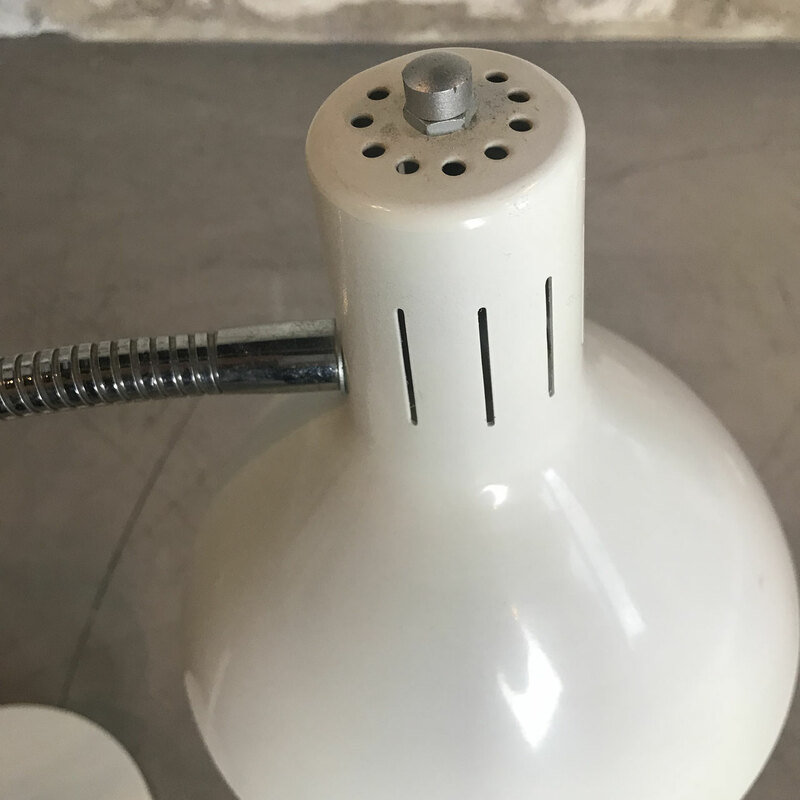 The lamp has a double E27 socket with a pull switch. 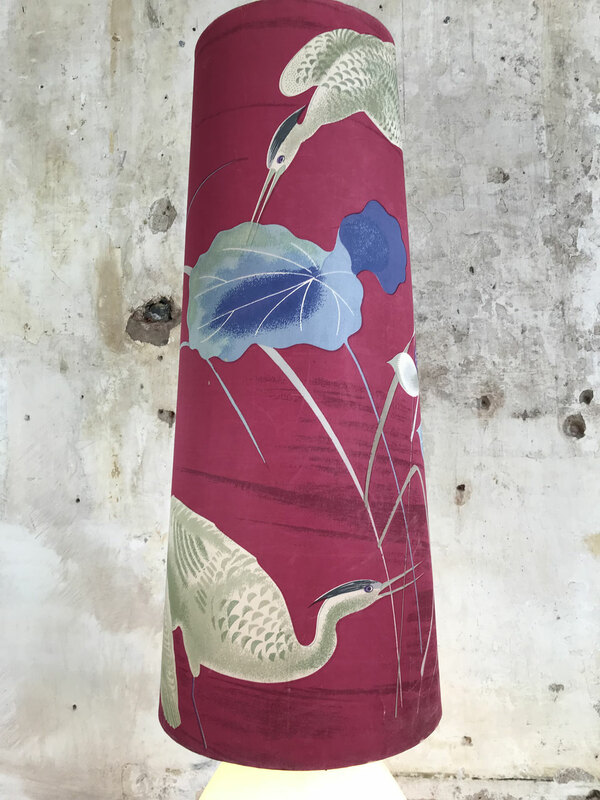 Expressive Large Vintage Floor Lamp from France. 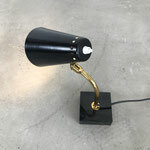 Very nice Brass base combined with Opaline Glass. 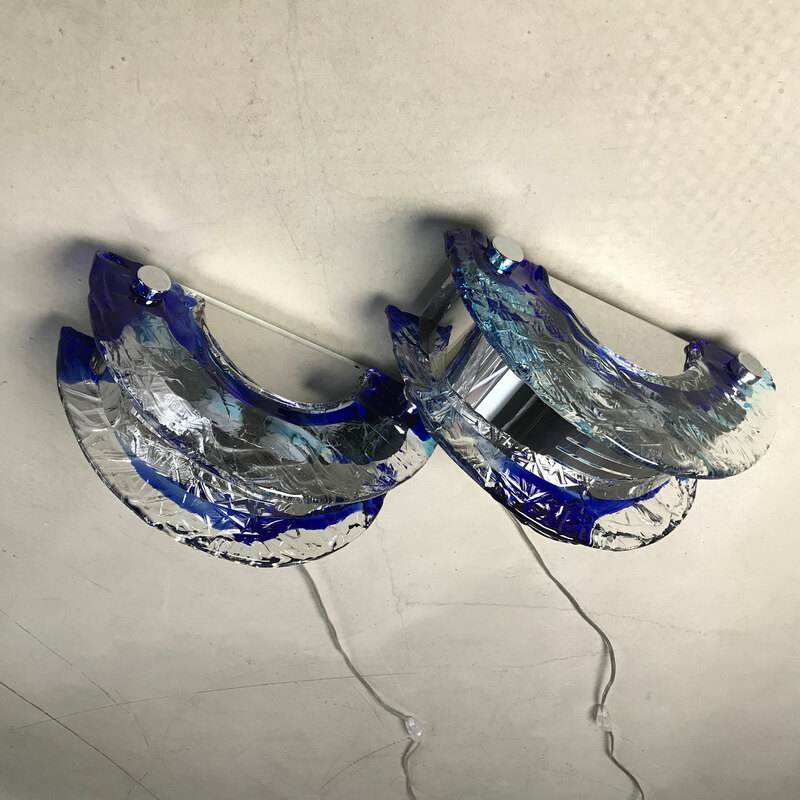 One light in the glass bottom and one light under the shade. 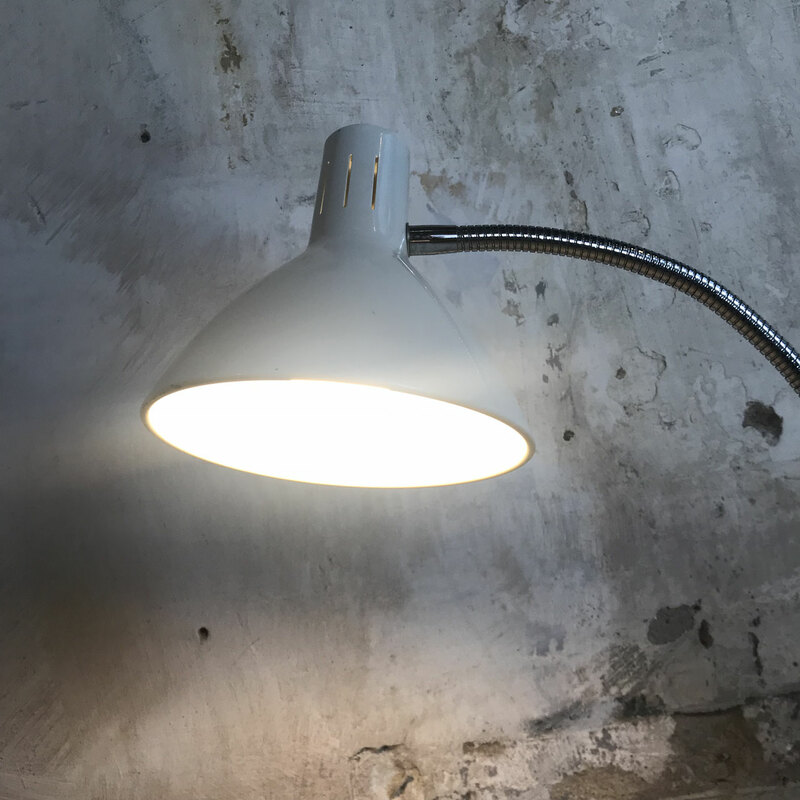 Original version with original shade, original wiring and original three-way switch. 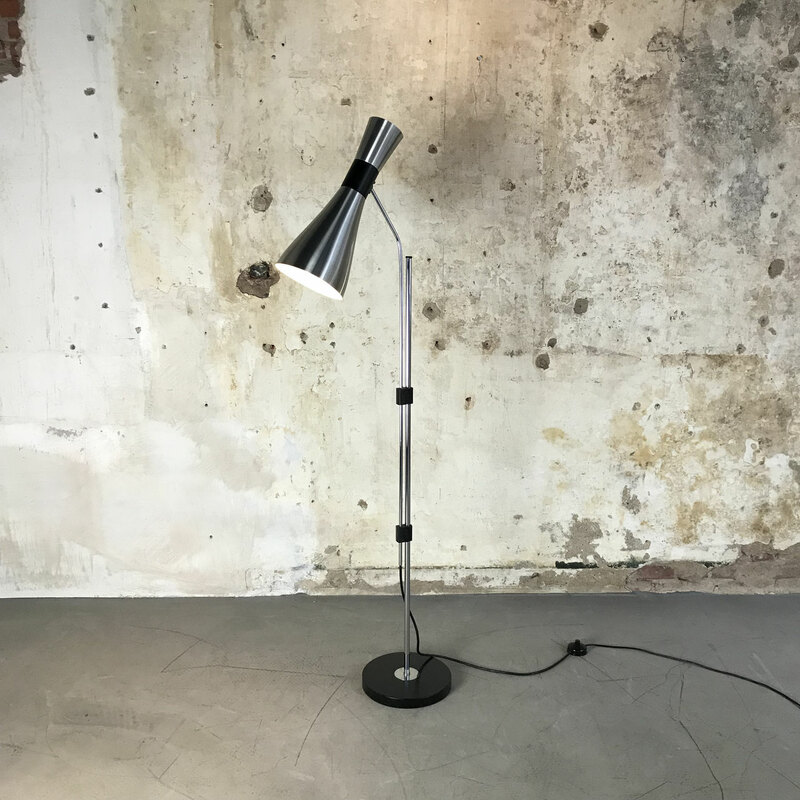 Industrial floor lamp from the 60's, nice example of vintage Scandinavian design. 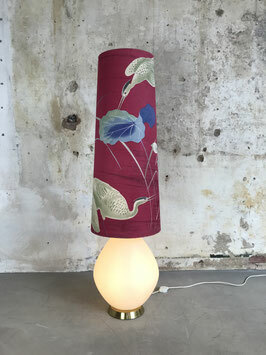 The design is by Hans-Agne Jakobsson, produced by AB Markaryd Sweden. 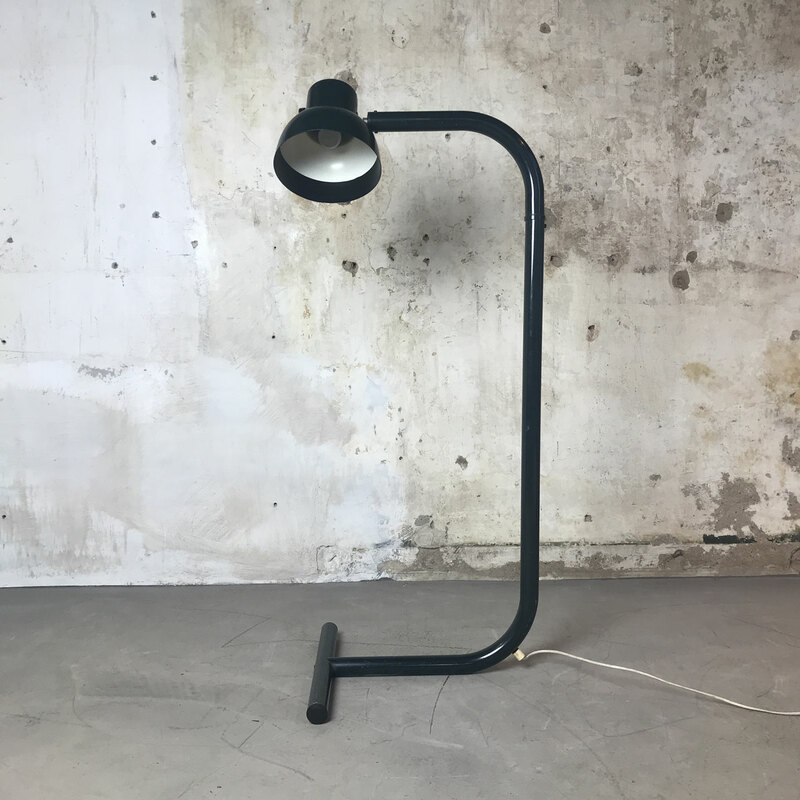 Very Rare Adjustable Floor lamp with Diabolo shade from Dutch manufacturer Herda (Amsterdam). Nice Dutch design in the manner of Stilnovo. 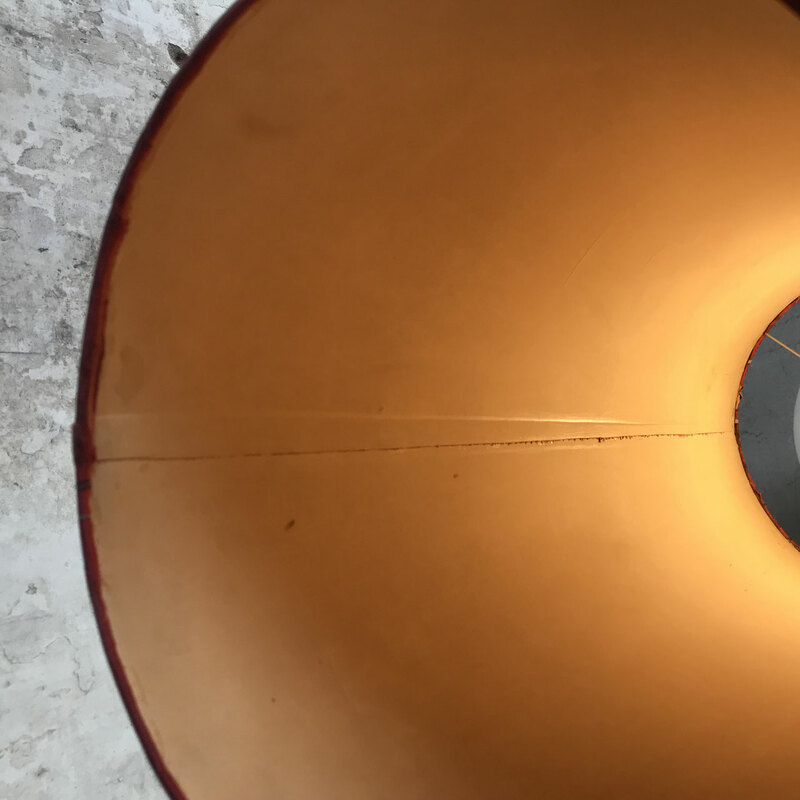 The lamp has it’s original copper lacquered shade, the inside is orange with two E14 sockets. 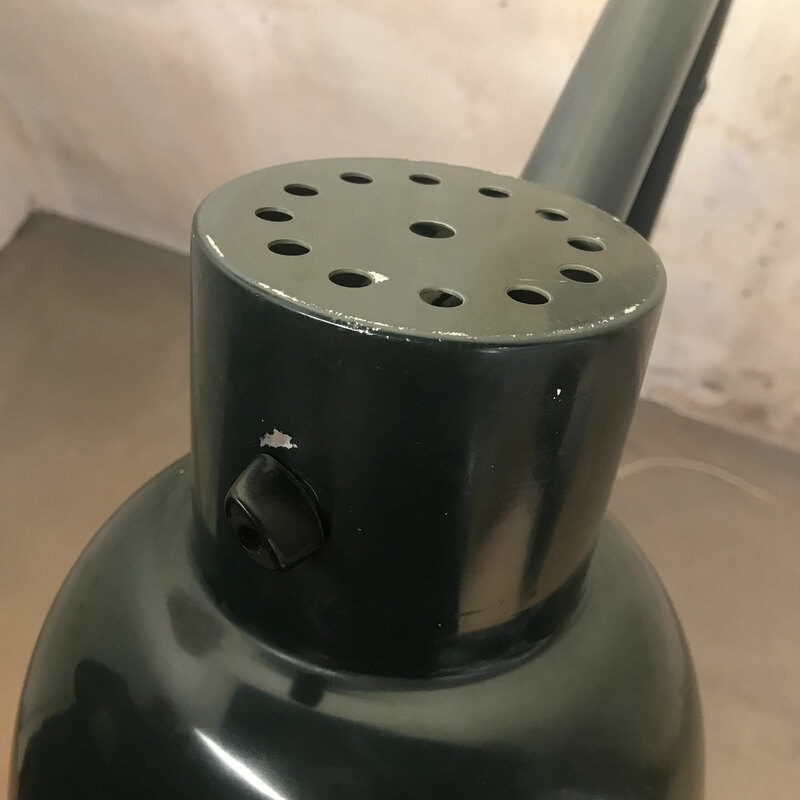 The black base is made of cast iron. 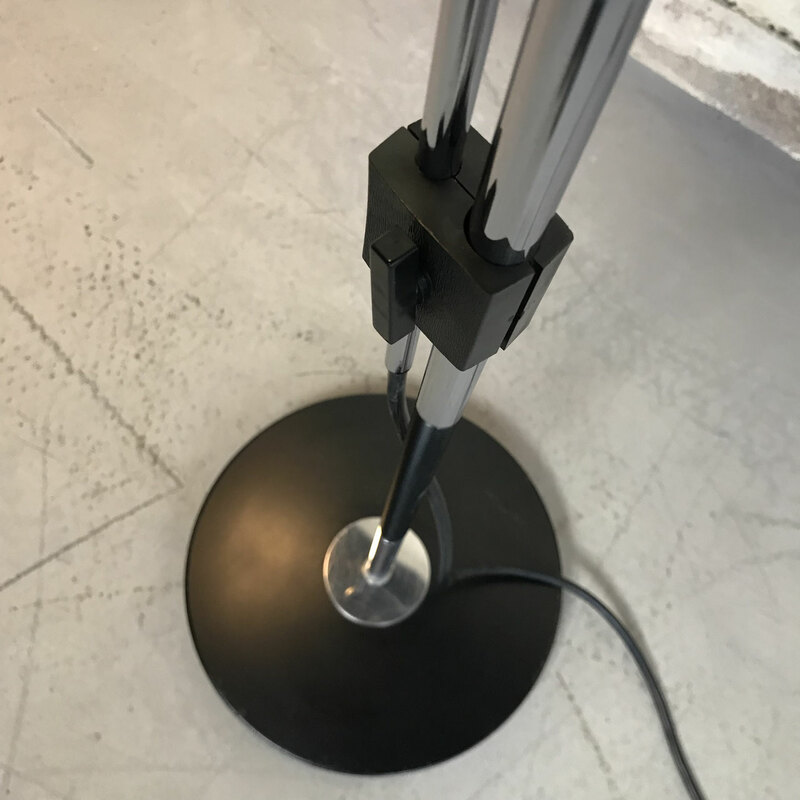 The lamp is adjustable in many different positions. The height is 137 cm high, the wide approximately 60 cm. 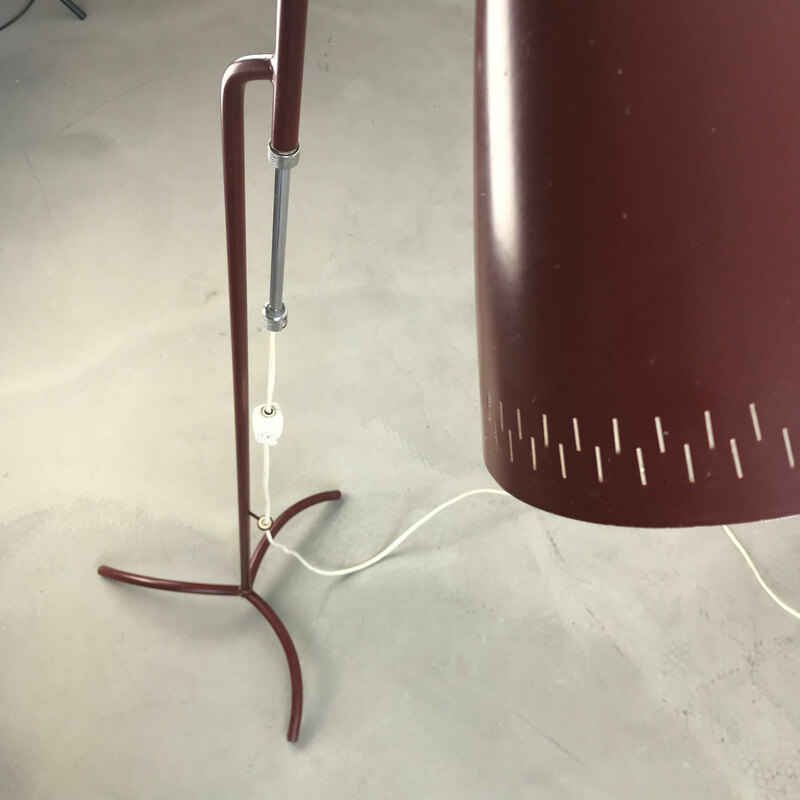 The diameter of the shade is 16,5 cm. 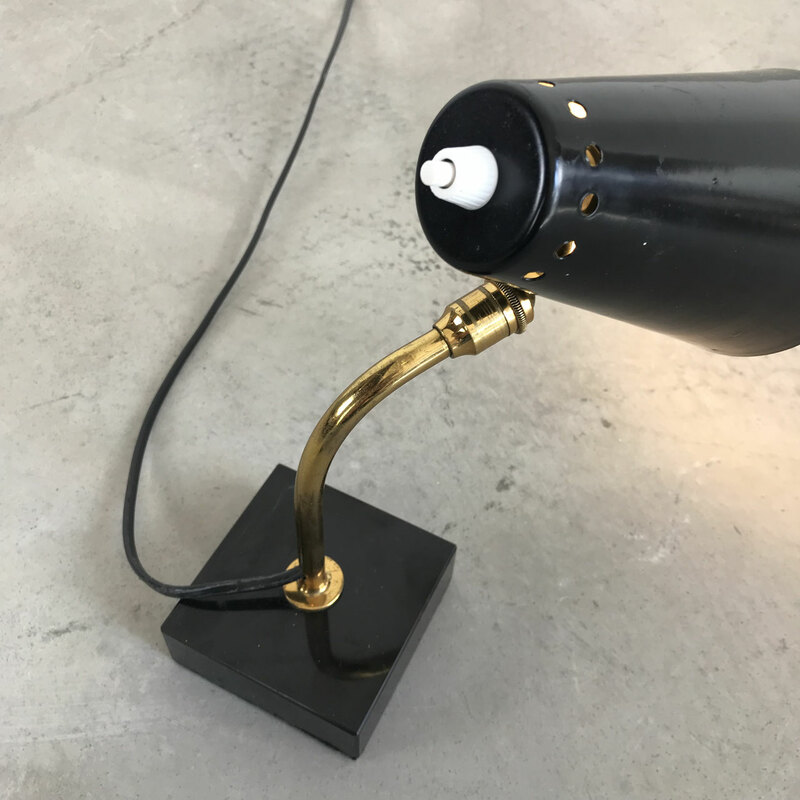 The lamp is in good condition with some minor signs of use appropriate to age. 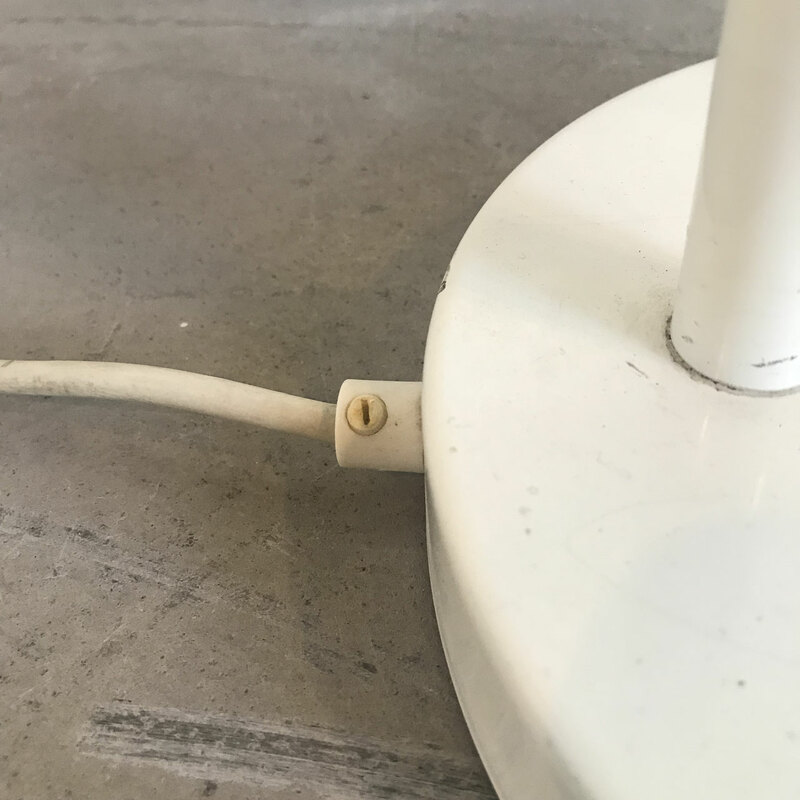 Marked on the bottom. 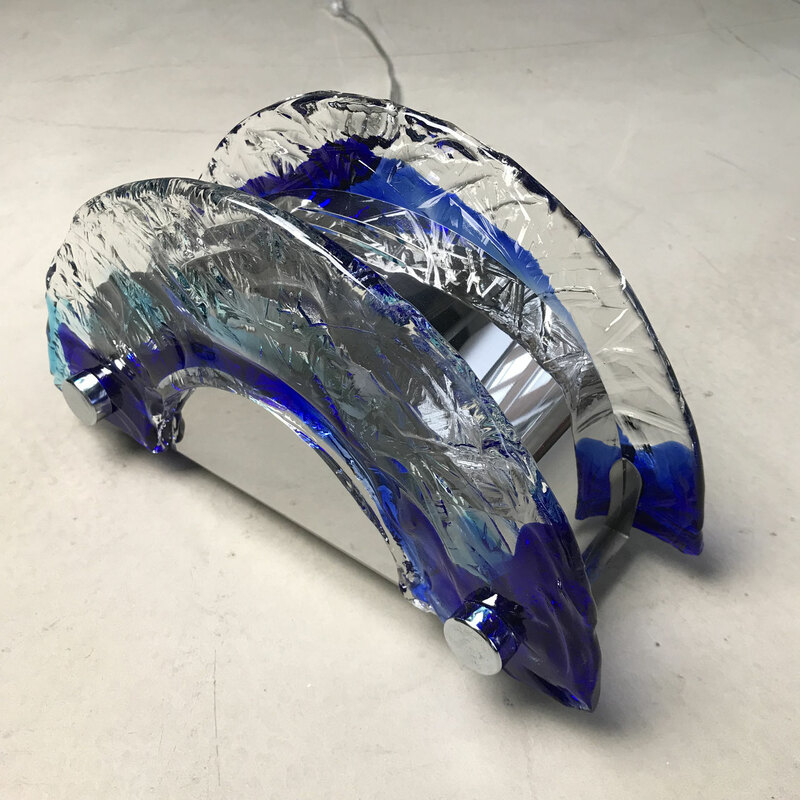 This will be a centerpiece of attention in any home or interior. 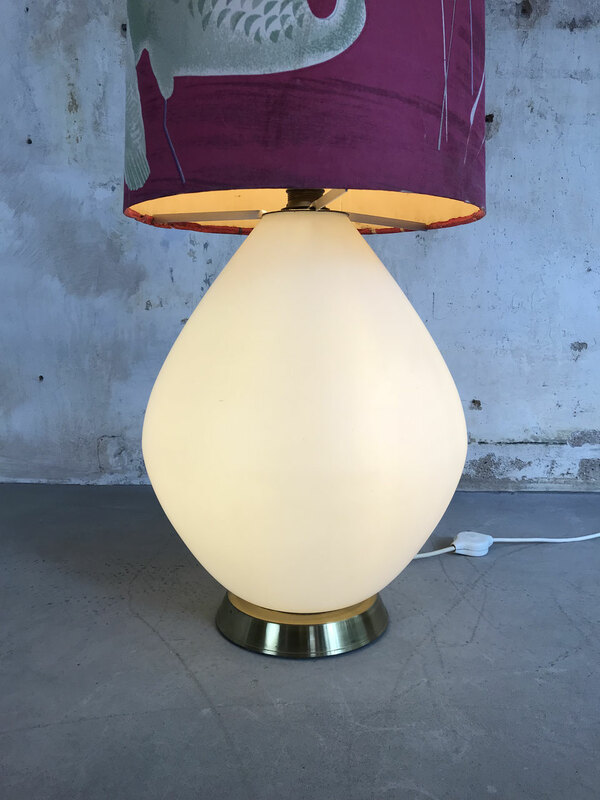 Very nice "Bubble Lamp" designed by Helena Tynell and produced in 1960s by Glashütte Limburg, Germany. 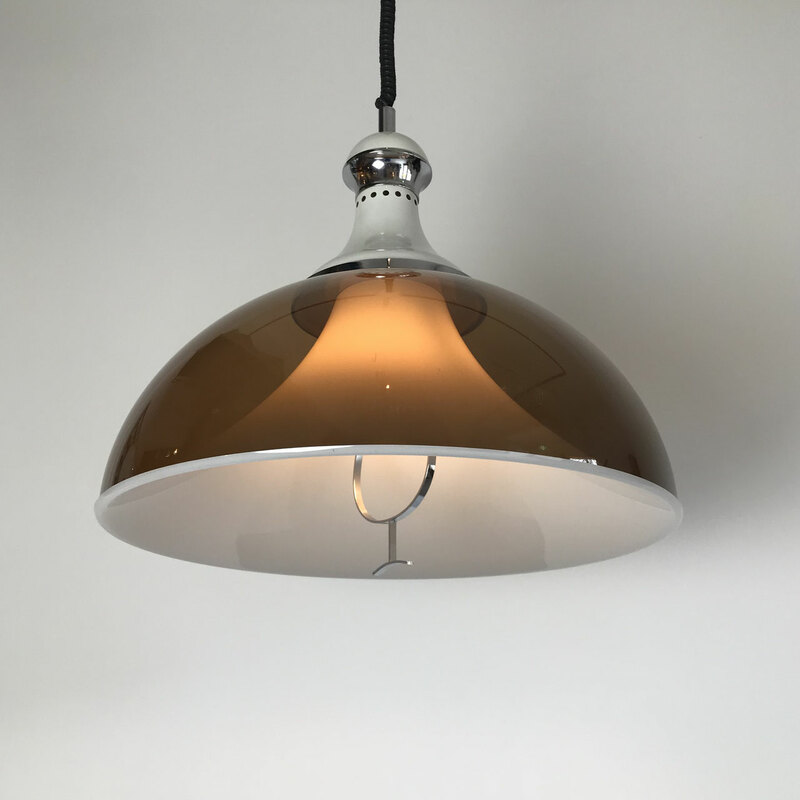 The beautiful shade is made of high quality Amber bubble press glass. 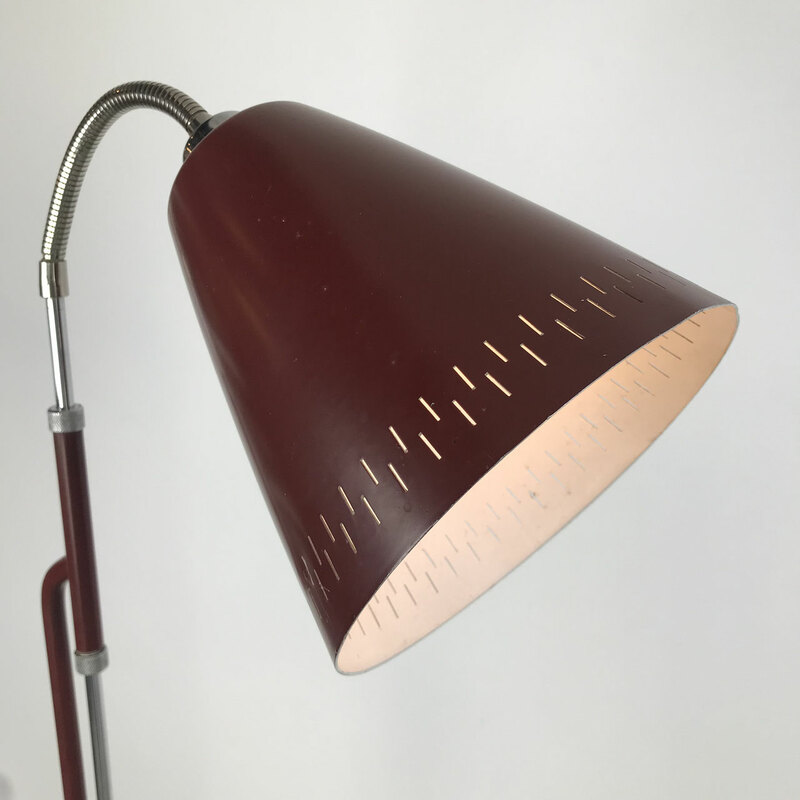 Due to the shade, the light creates a warm atmosphere of defused light. 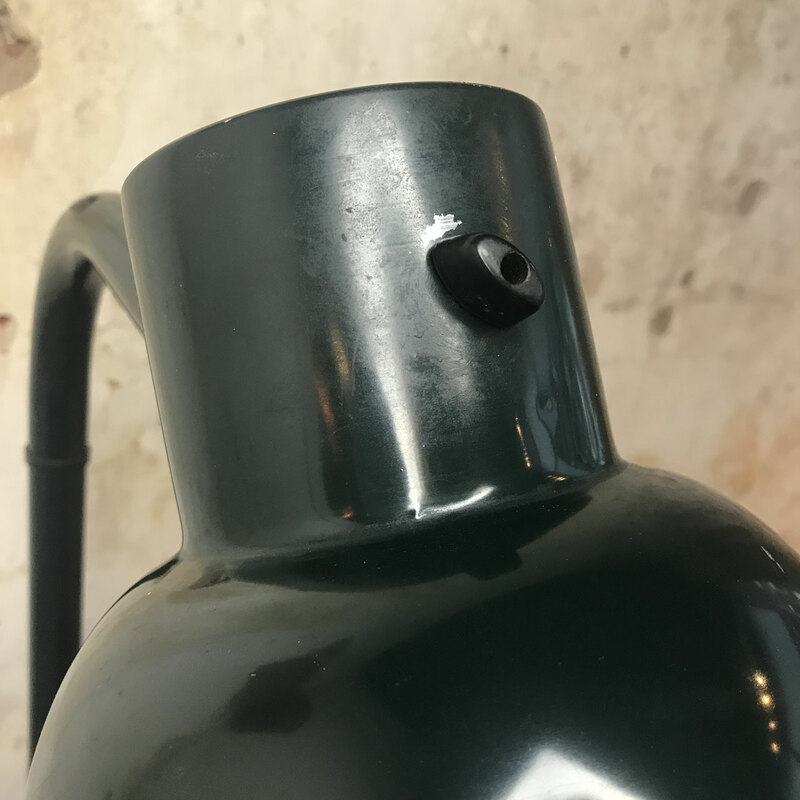 The light has one socket for bulb E14.